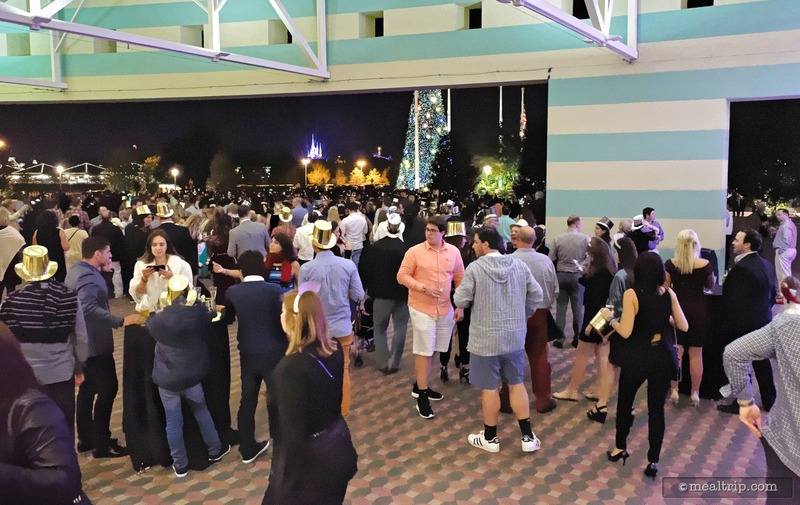 The Disney Countdown to Midnight: A New Year’s Eve Celebration listing is a Special Event dining location at Disney's Contemporary Resort featuring Wine, Beer, Spirits or Beverages, Small Plates and Tapas Style cuisine. There are 112 photos in the Mealtrip photo gallery for this location and dining period. 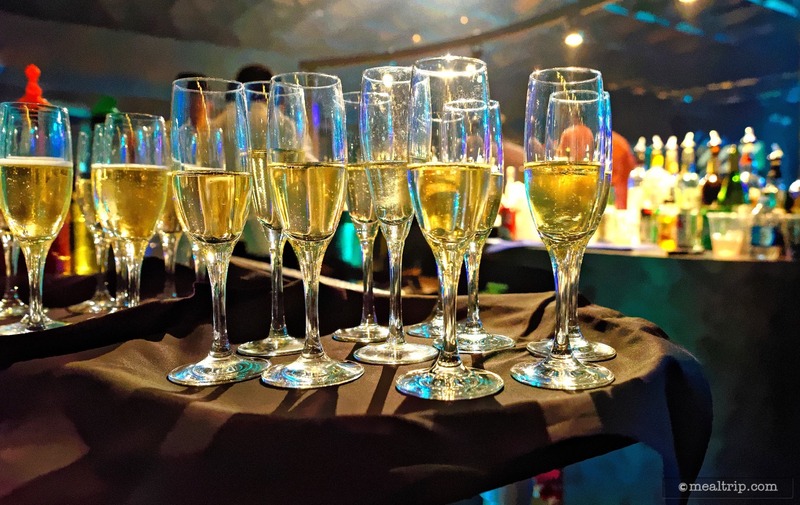 The Disney Countdown to Midnight: A New Year’s Eve Celebration listing currently has a score of 90 out of 100. 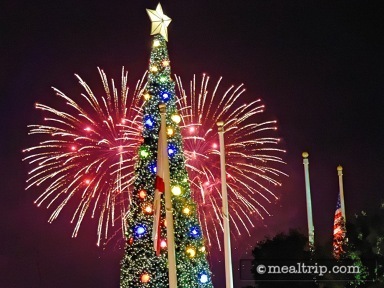 Click here to read all of the reviews for this location, or log in to Mealtrip.com to add your own review for Disney Countdown to Midnight: A New Year’s Eve Celebration. 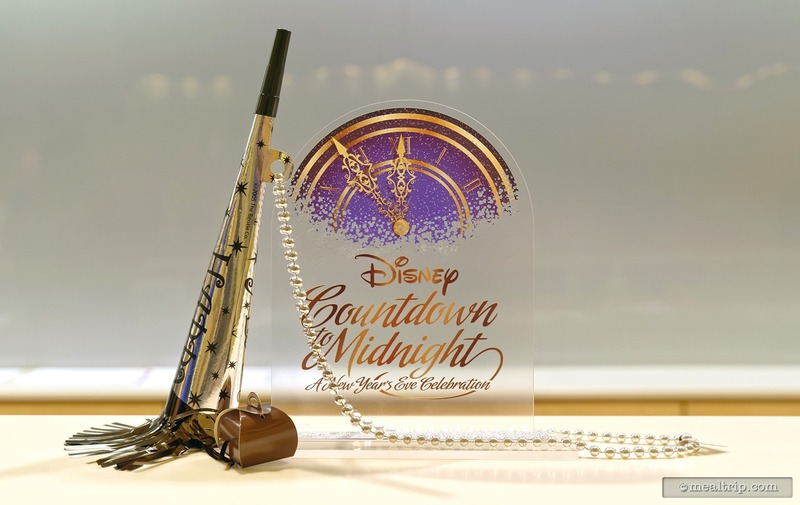 The Disney Countdown to Midnight logo. 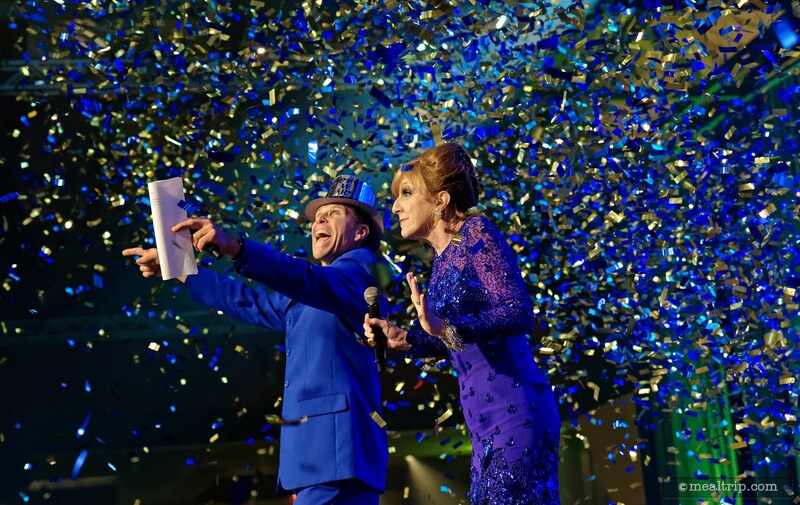 Your emcees for Disney Countdown to Midnight: A New Year's Eve Celebration! 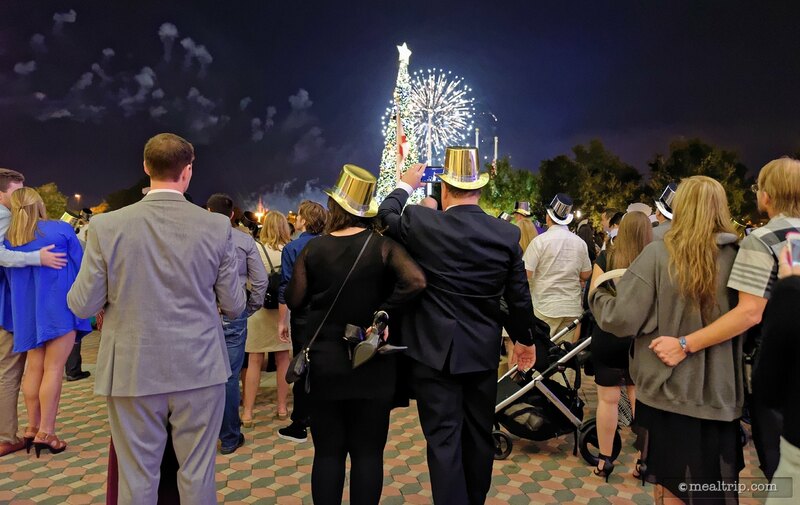 The emcees for the event will keep everyone up to date on the evening's schedule, and most importantly, when to grab a glass of champaign and head outside to watch the amazing Magic Kingdom fireworks at midnight! 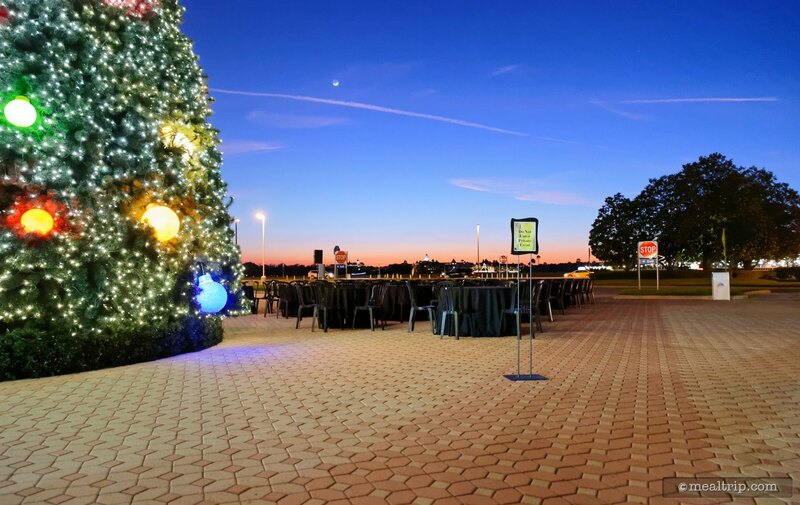 New Year's Eve outside the Contemporary Resort. If you're in the lobby of the main Contemporary Resort building, look for a sign like this, which will point you to the Fantasisa Ballroom. Keep following the arrows to find the event check-in area. This sign is located in the main Contemporary Resort Lobby. 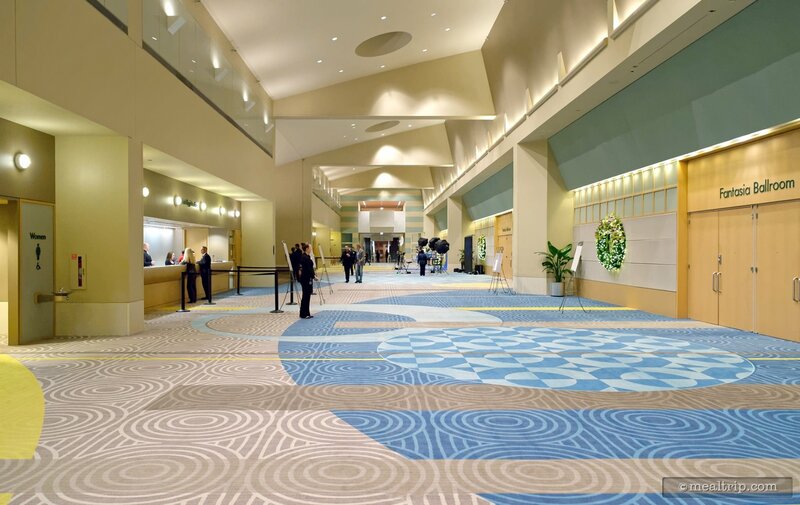 Looking west down the Fantasia Ballroom Lobby hallway. From this perspective, the doors to the main event space are on the left. 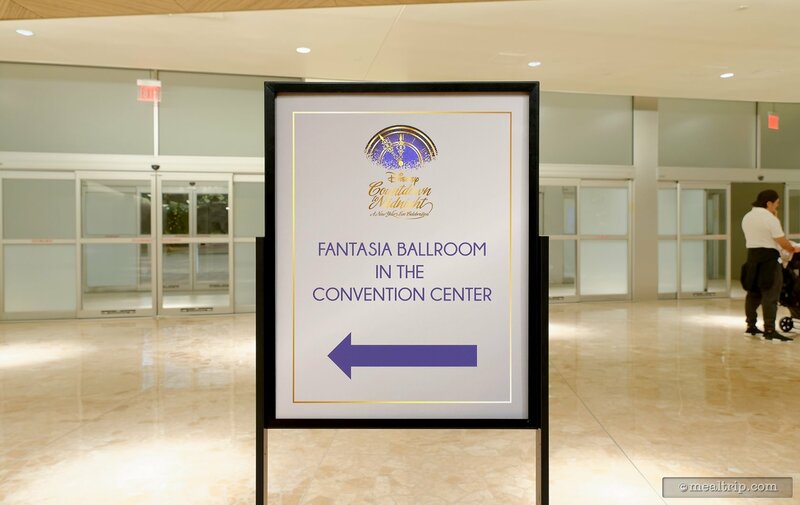 Looking east down the lobby hall of the Fantasia Ballroom event space. 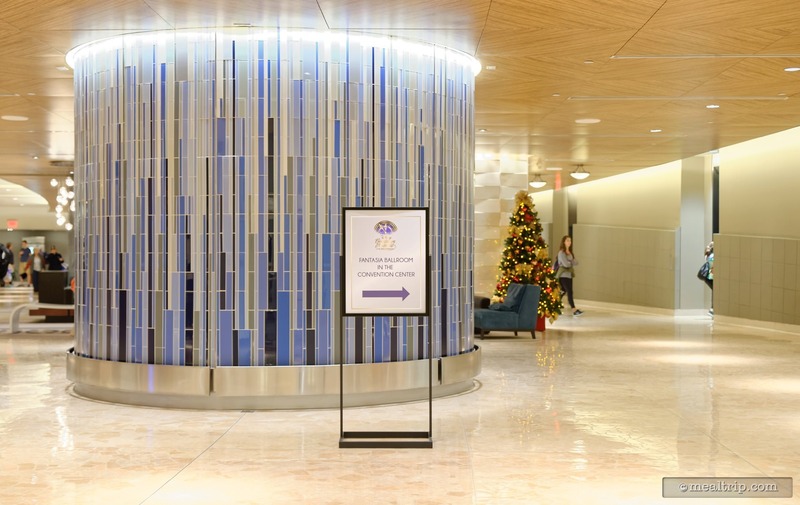 The check-in desks are on the left and the doors leading into the Countdown to Midnight New Year's Eve event are on the right. 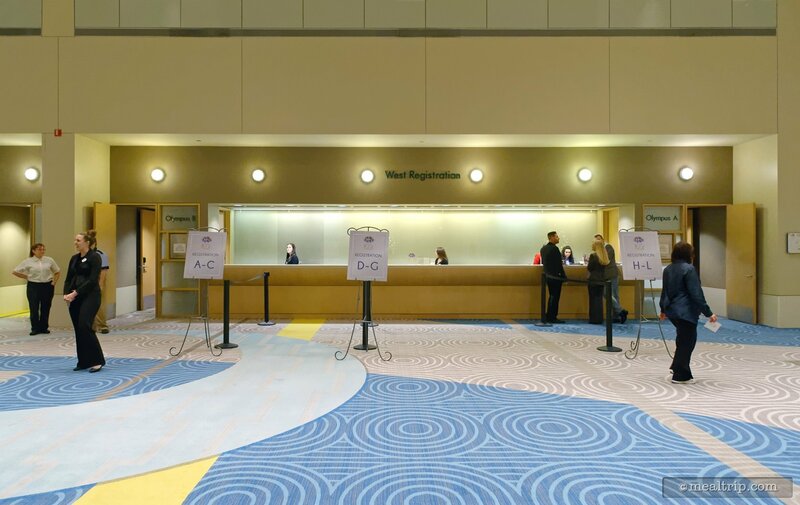 There are east and west check-in desks for the Countdown to Midnight event. Pictured here are the (last name) "A" through "L" areas. Once checked in, you will be given a wrist band that lets you into the event. 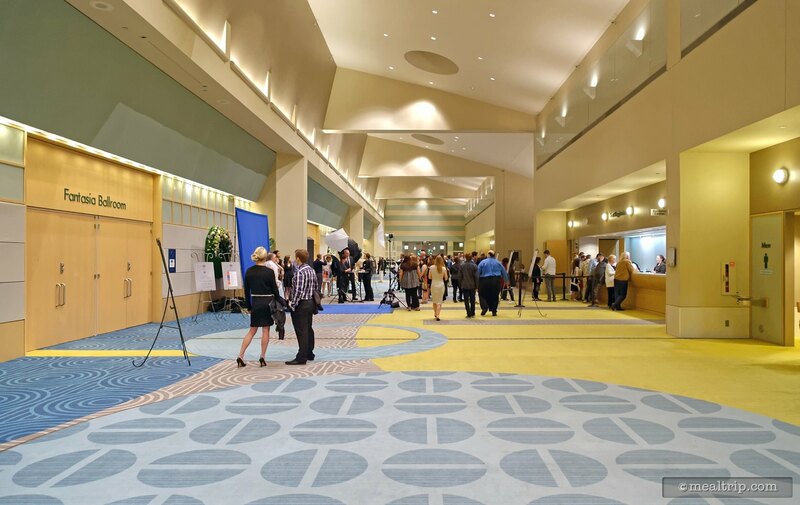 The very large lobby in front of the Fantasia Ballroom at Disney's Contemporary Resort. 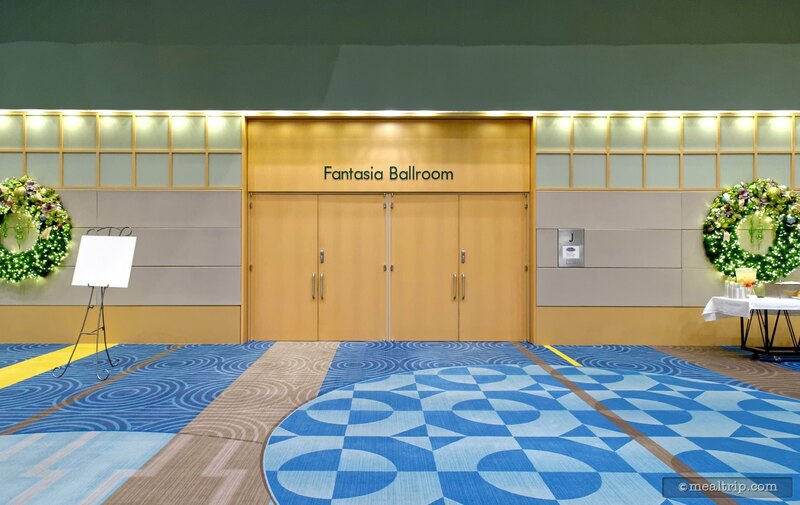 There are (at least) three doorways like this one that lead into the Fantasia Ballroom. 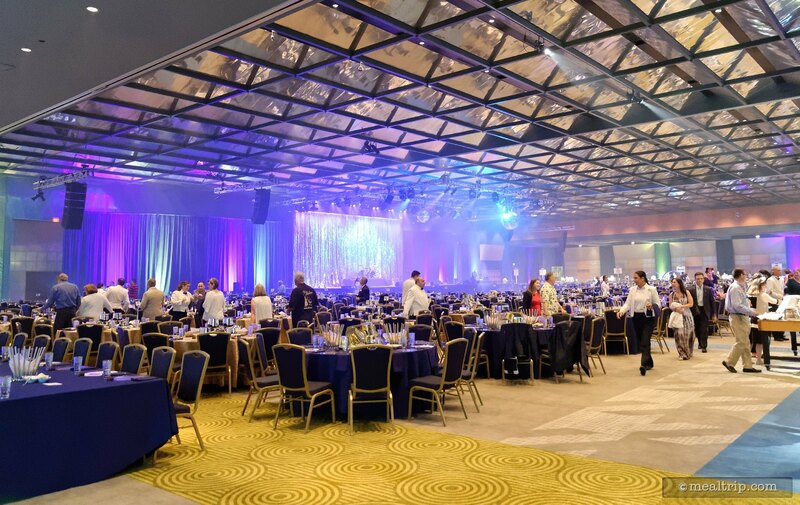 It's a pretty big event space. These cool Countdown to Midnight signs are on the check-in desk. Once inside, you'll find a little tiny box of hand dipped chocolate (among many other things) at each place setting. 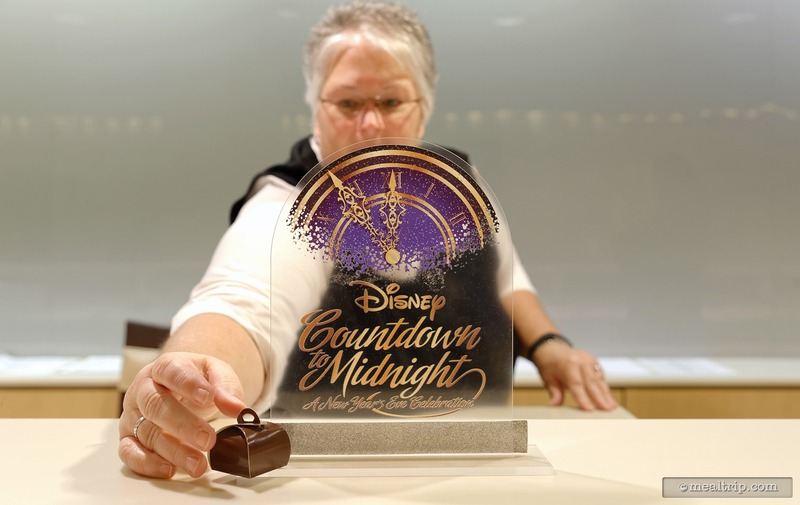 The Disney Countdown to Midnight logo on a clear acrylic stand is at the registration desk, along with a small box of hand made chocolate ganache and a new years eve horn. 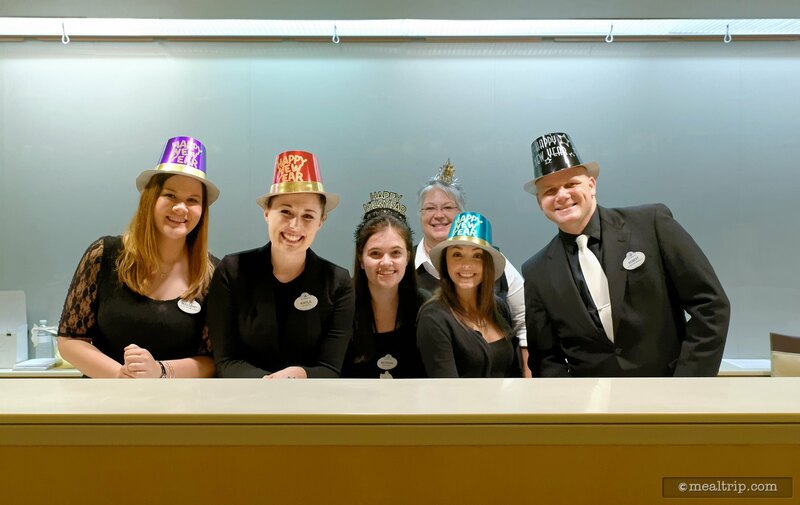 The amazing registration and check-in cast at Disney's Countdown to Midnight! Hi Everyone!!! Thank you so much for a great event!!! 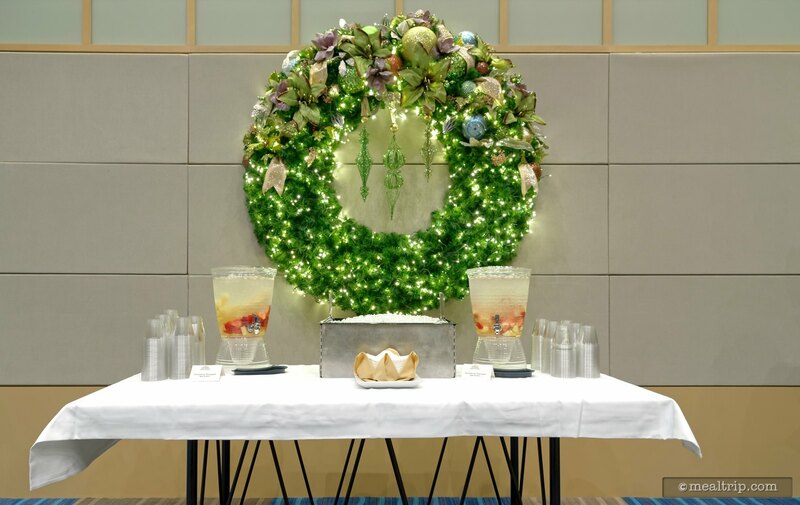 There's a couple fruit infussed water stations in the lobby and check-in areas while you wait for the event to start. 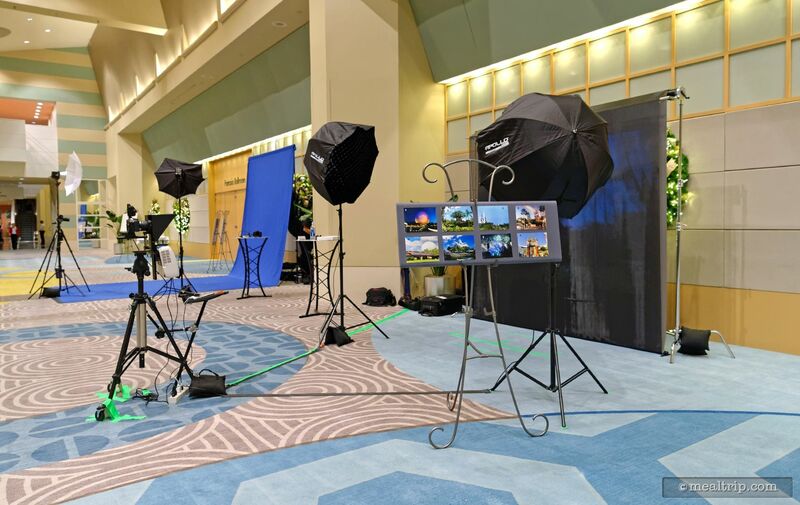 Disney Event Photographers are on-hand to take a photo of your group, and they even have several digital backdrops to place you in the parks for a New Year photo!!! There are several Disney Event Photographers set up in the lobby of the Fantasisa Ballroom. 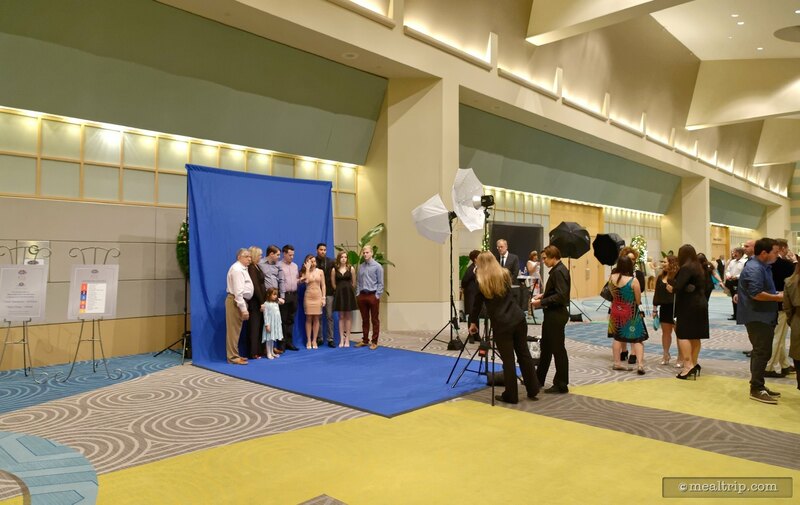 You can grab a comlimentary group shot before and/or during the event! Disney Event Photographers are on-hand to take group photos. You will be given a small card with instructions on how to download your photos from the night's event. 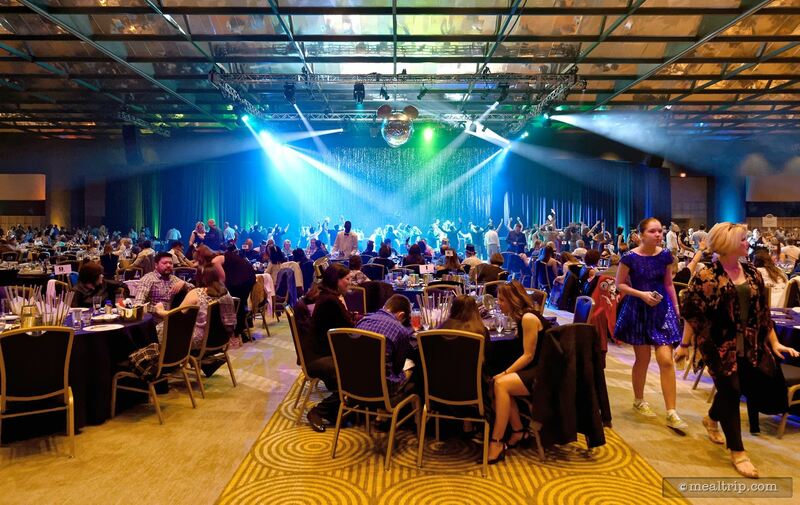 The Fantasia Ballroom is the main location for Disney's Countdown to Midnight event at the Contemporary Resort. 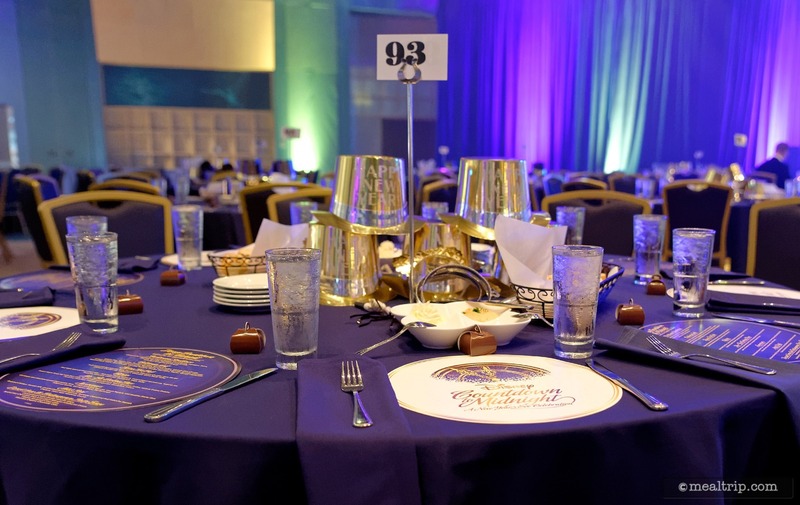 All the table settings that I saw were for 10 or more, smaller parties will be seated together... but they are very large tables. I never really felt too close to my other table guests. 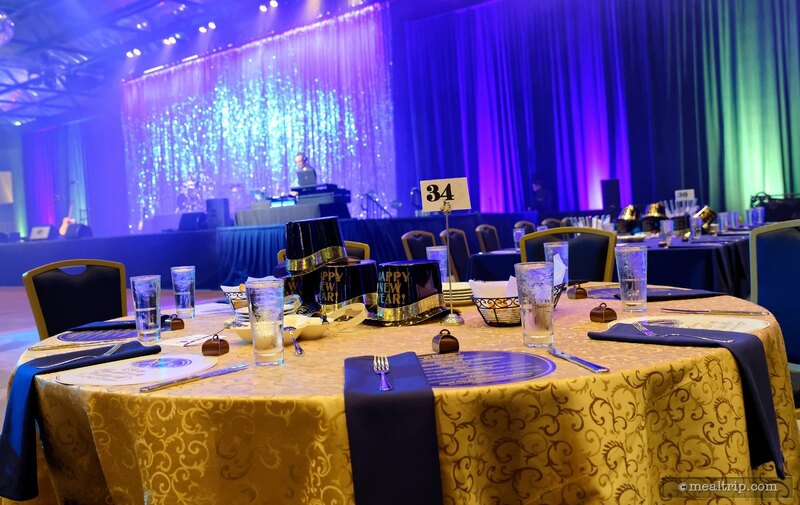 Here's a table that's really close to the dance floor with a great view of the main stage! Hi everyone!!! 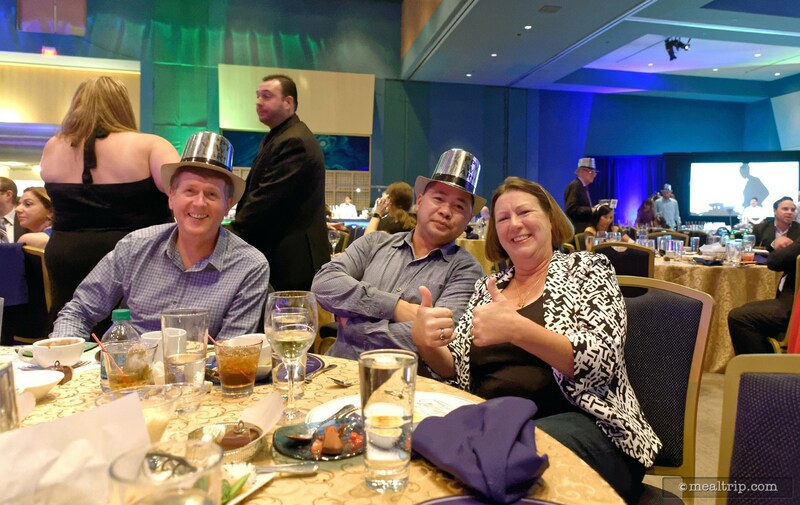 Here's some of the guests that were at my table!!! I hope everyone is doing well!!! There are a few tables set up outside under the Porte Cochère. These are not assigned and are open to anyone that's attending the event... however... it is quite a walk back to the food and beverages in the main room. 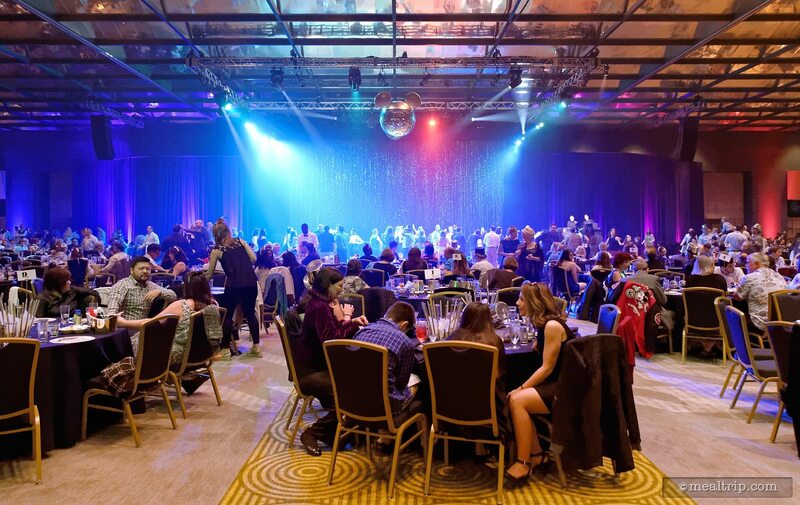 Here's a photo of the Fantasia Ballroom right as the Countdown to Midnight event starts. It's a very large space - but the event does sell out, so if you're interested, it's never too soon to book this one. 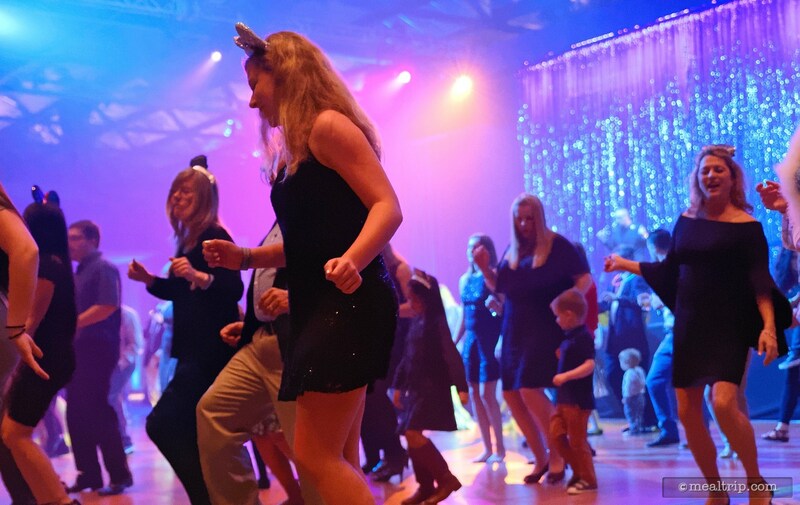 Check out that Mirrored Mickey Ball over the center of the dance floor! 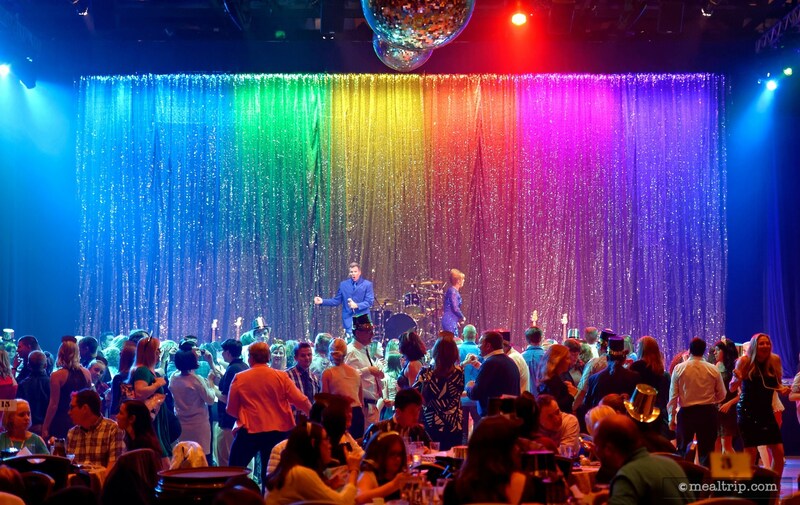 There is a pretty large dance floor space in the middle of the room, just in front of the stage! 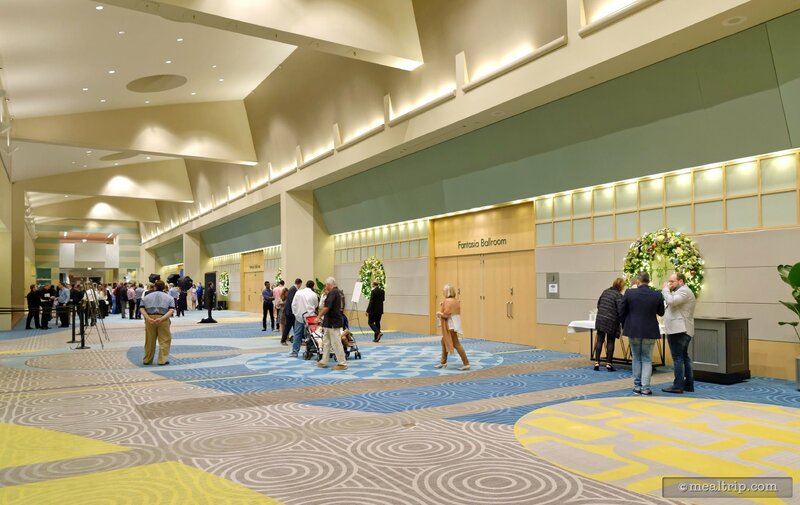 This photo was taken from one of the three main door entrances into the Fantasia Ballroom event space. 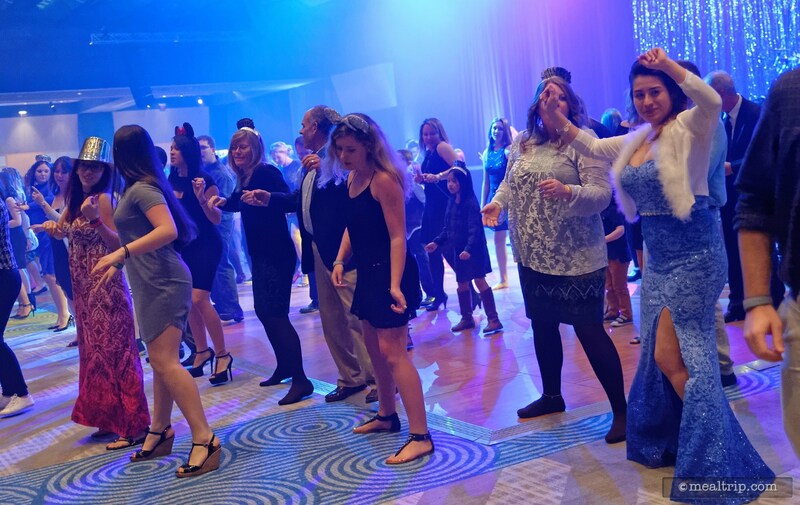 There's plenty of room on the dance floor for everyone! 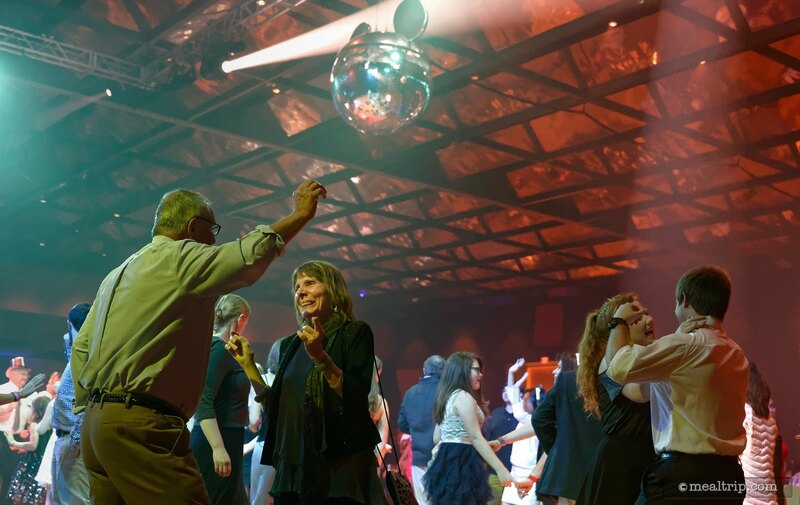 Here's another photo of that cool Mickey Mirror Ball hanging high atop the dance floor. 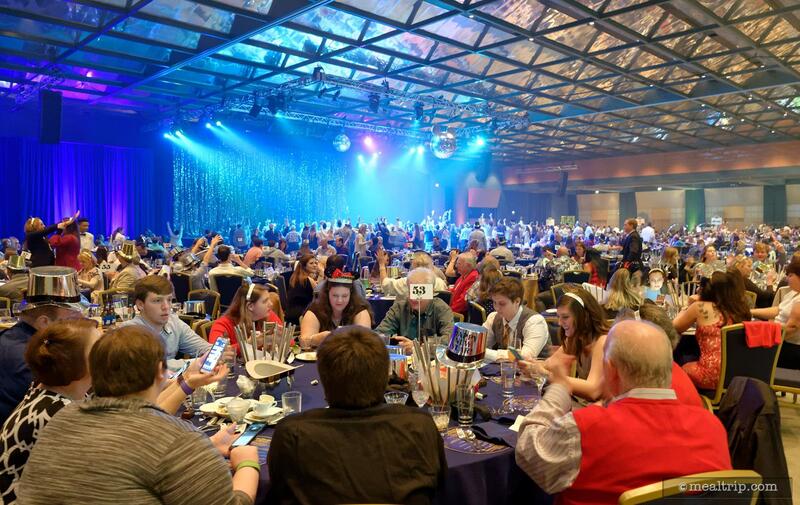 The main stage as seen from the back of the room at Disney's Countdown to Midnight New Year's Eve Event! The dance floor space is quite large, this is about as "full" as the area would get. 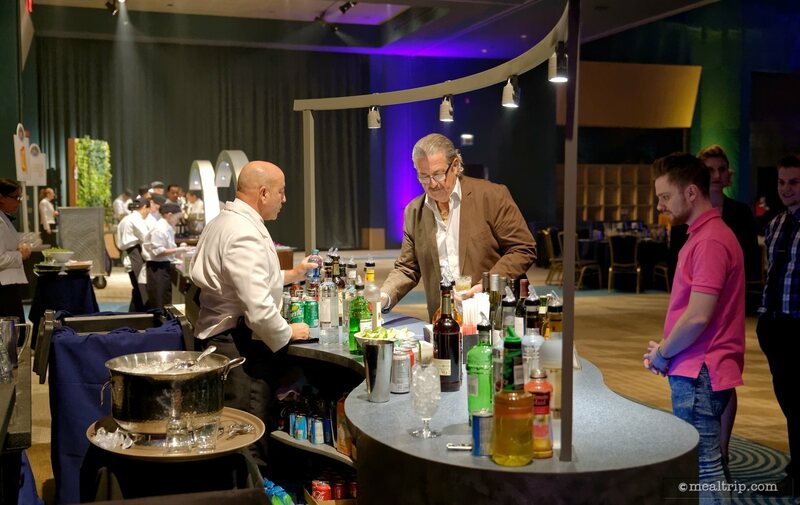 For beer and mixed cocktails, there are mini bartender stations located throught the event space. 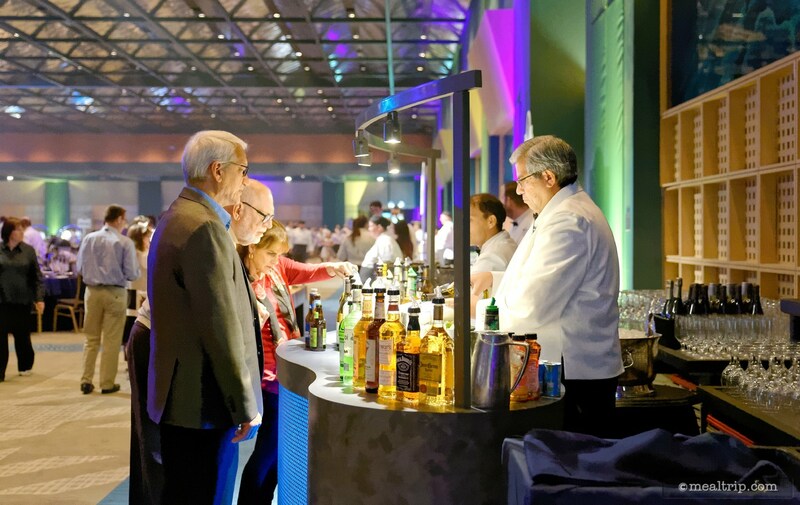 At peek times, I saw maybe a half dozen people in a line at the beverage stations... most of which had two bartenders. 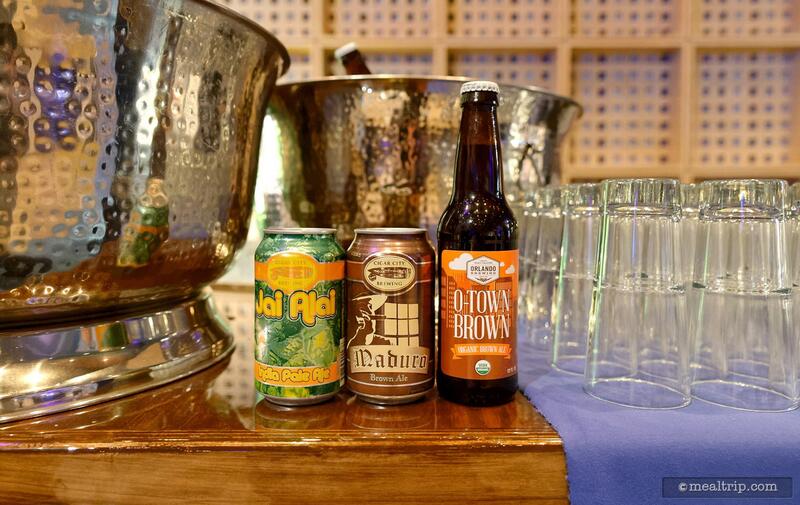 Here are a few more beer options, and a couple of the "pairing" wines were also located at the cocktail stations. 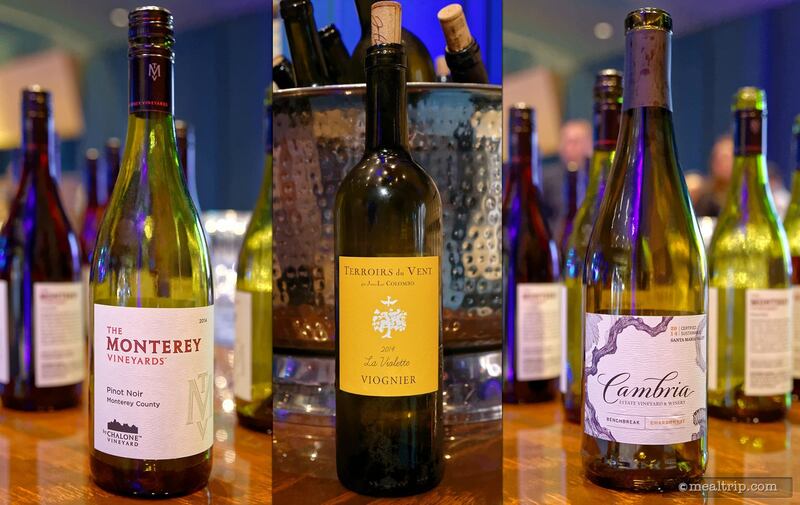 Here are a couple of the wine selections. 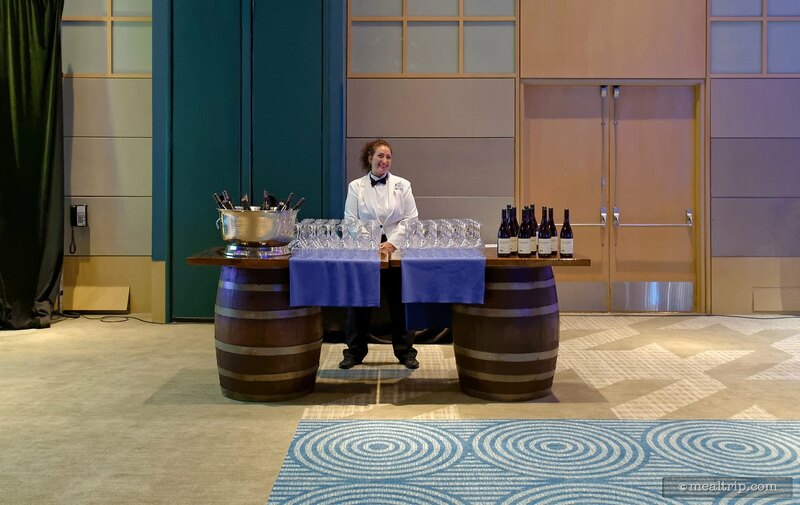 Each food item listed on your menu, also had a suggested wine pairing that was available at a beverage station near the food. 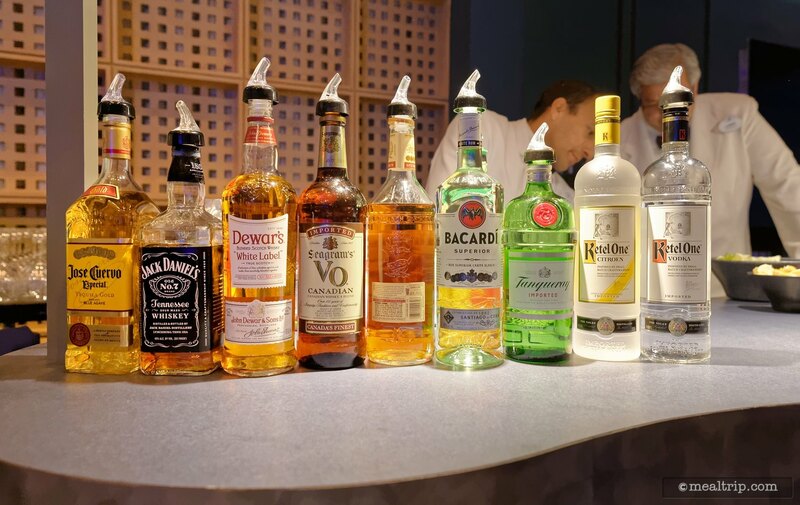 Here are some of the hard liquor beverage that were available, mostly for making mixed cocktails. Pretty much anything you might ask for could be made to order! 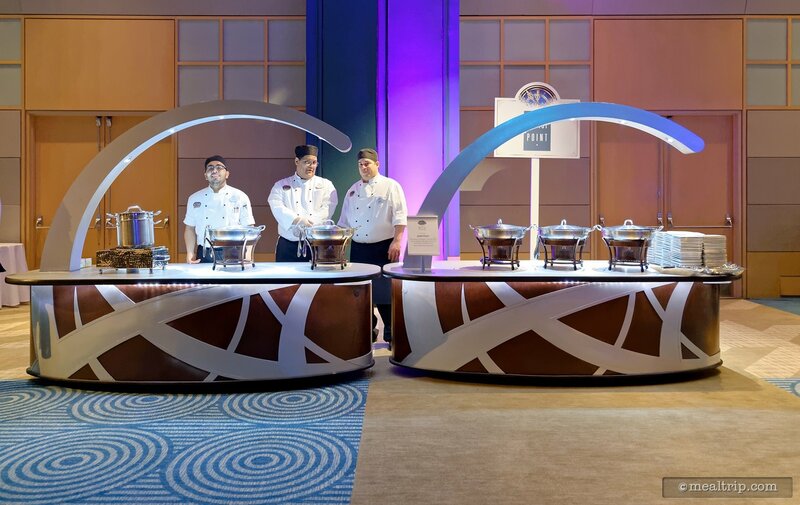 Here's one of the culinary stations that were positioned along the walls of the Fantasia Ballroom. The stations were duplicated on the far side of the room... so there were two locations that were making each item on the menu. 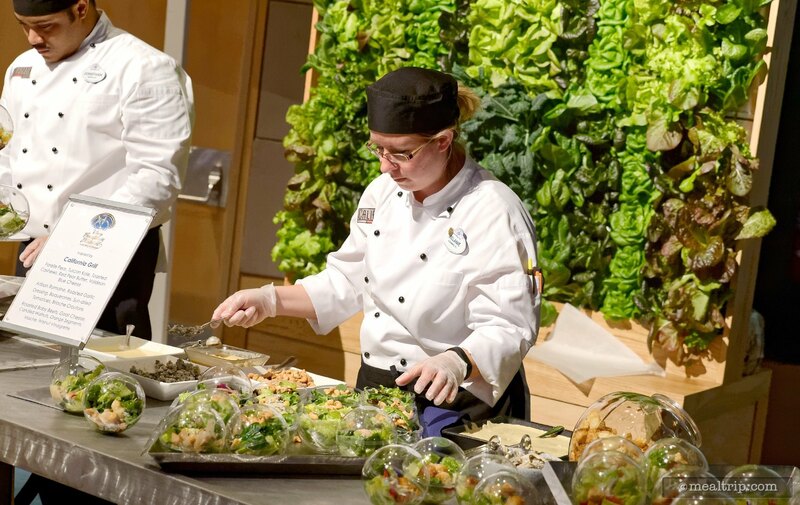 So you just walk up to any of the culinary stations, and they will make and plate the item that's on the menu. Each station has a sign, letting guests know which restaurant they are from. 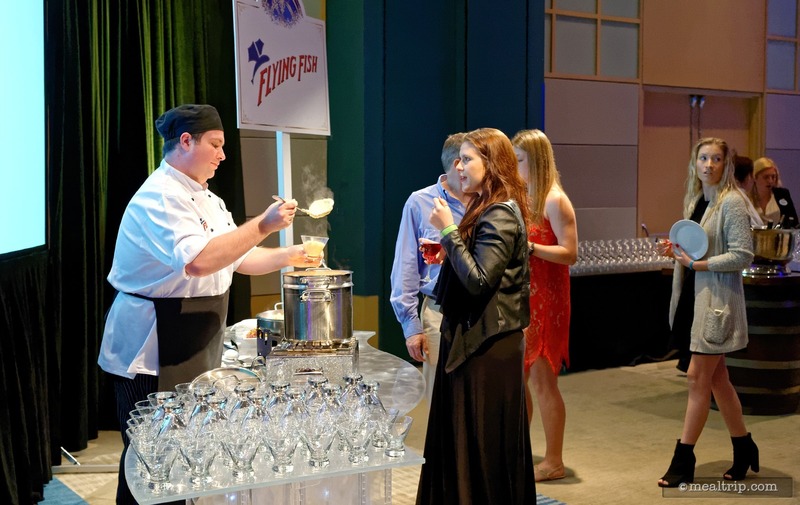 Here a Flying Fish chef creates their dish for the night, Rock Shrimp with Tillamook Cheddar Grits in a Martini Glass! 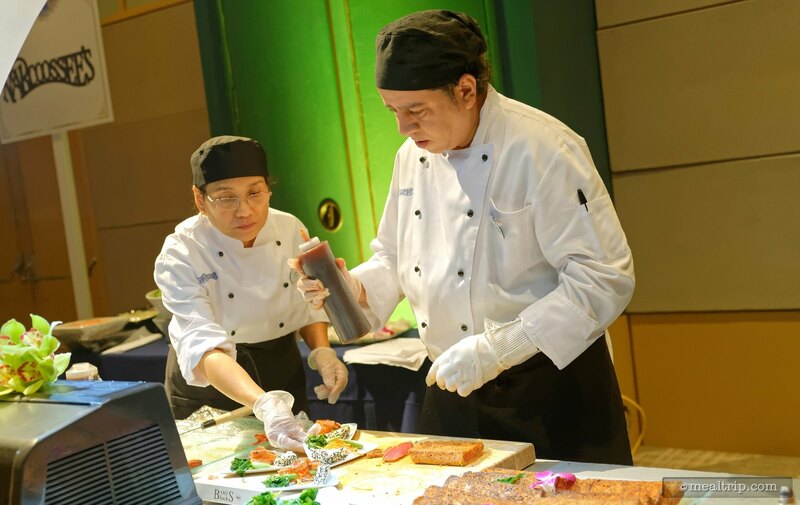 Here's the team from Narcoossee's plating some delicious Coriander and Shichimi-spiced Ahi Tuna. 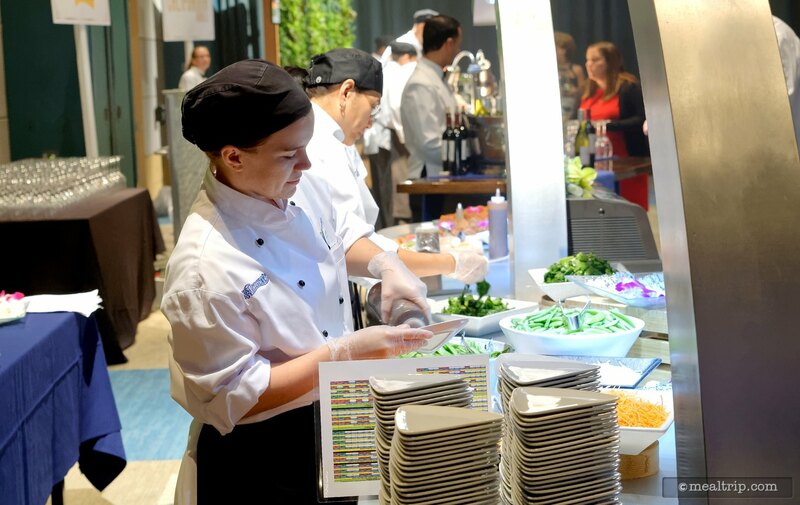 It's so great getting to interact with the chefs as they plate their featured dish! 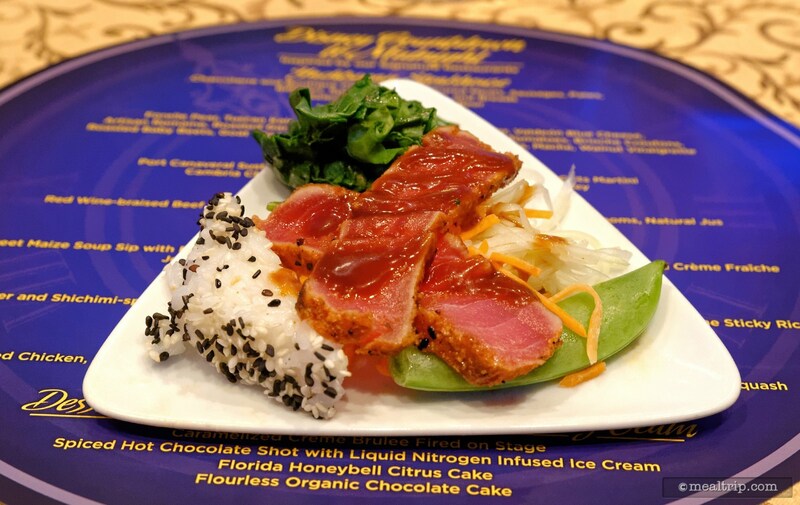 And here's a closer photo of Narcoossee's Seared Ahi Tuna dish, with Charred Beans, Gai Lan, Green Papaya, and Sesame Sticky Rice. Look at all those plates ready to go! 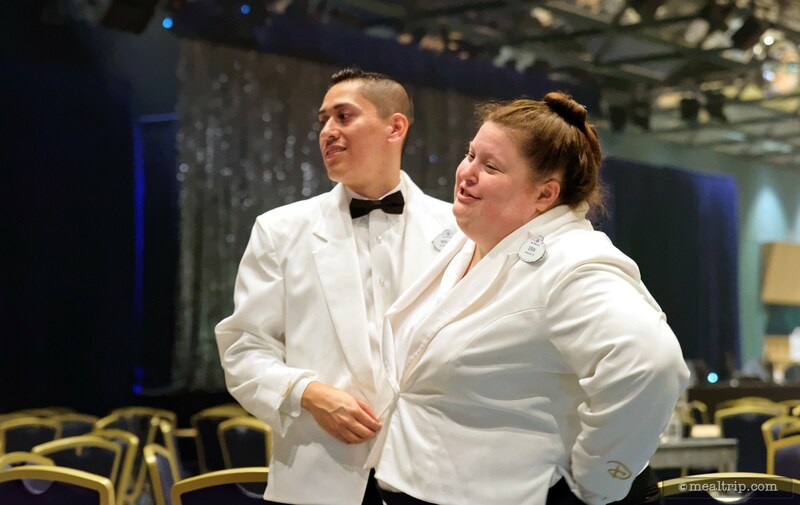 These cast members are an amazing part of what makes this New Years Eve Event so special. Thank you to them, for some really amazing year-end food! 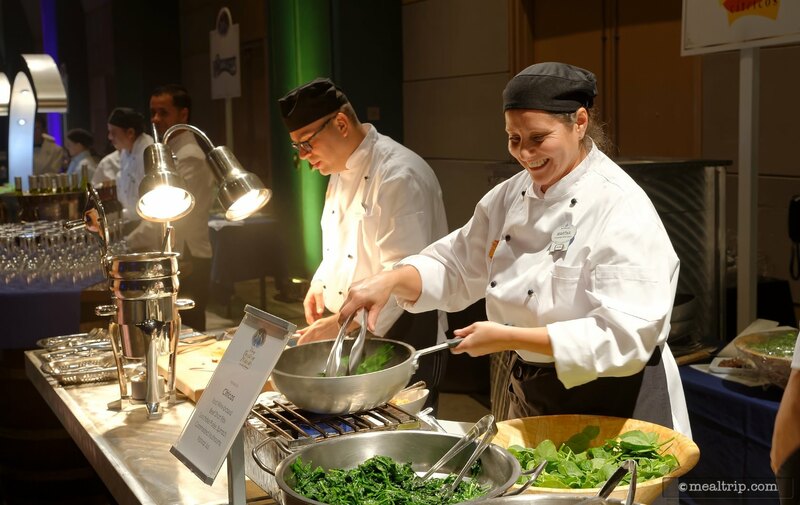 Some chefs from Citricos are busy sautéing some spinach and caramelized mushrooms for their Red Wine-braised Beef Short Ribs plate. 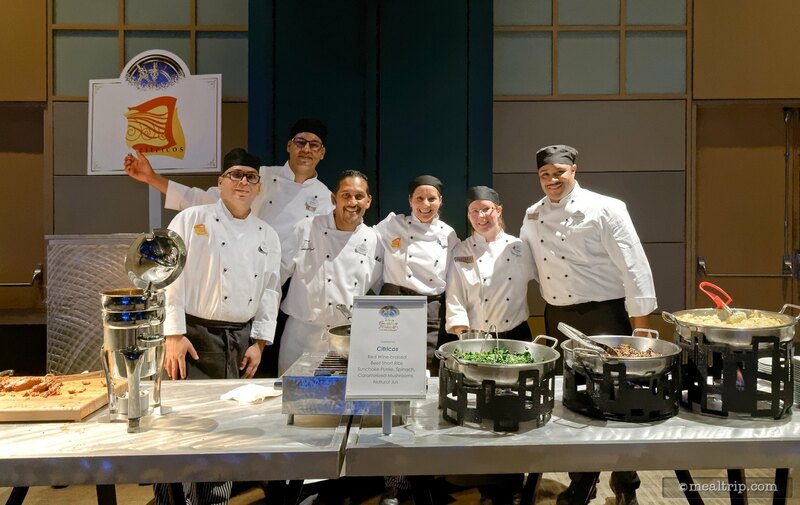 The amazing culinary team from Citricos! Thanks so much for a great Beef Short Rib dish! It was sooooo good!!! This station was just so cool. 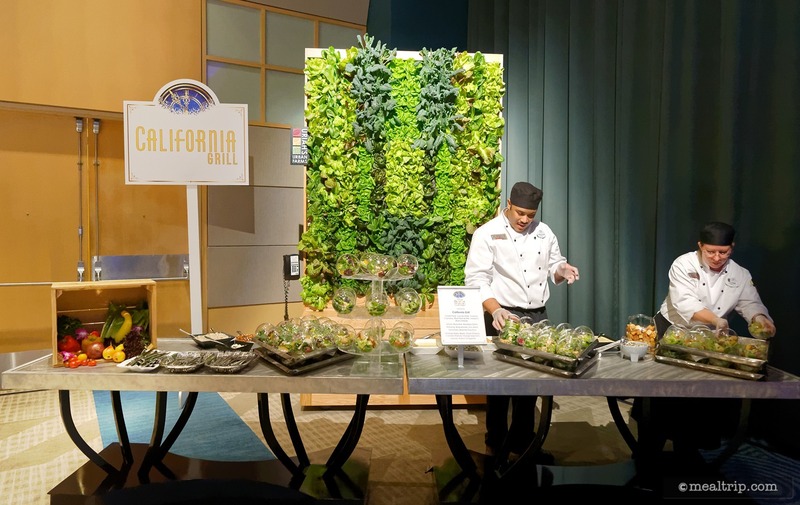 It's a salad wall, from the team at California Grill — they were plating three different salads to choose from! 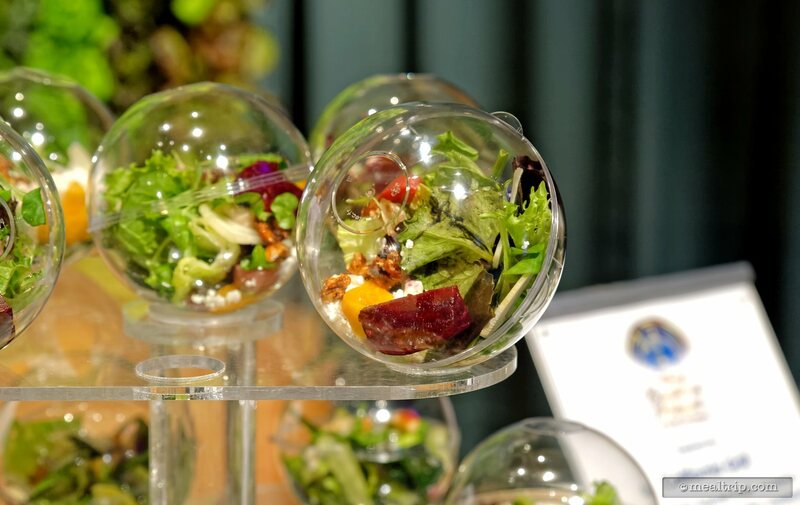 The plating for California Grill's Salad was very cool as well... each of the three salads were built in these clear salad spheres! Perfect for shaking the dressing around! Here's a close up of the finished plated salad! So cool! 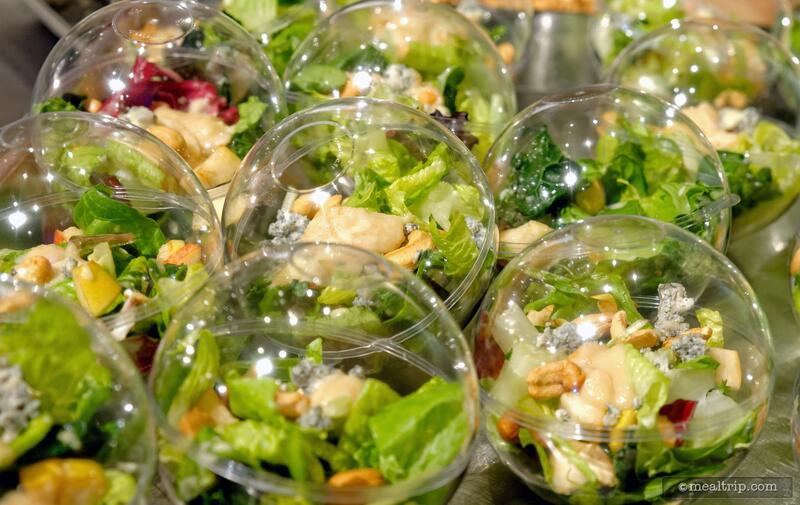 The salad spheres let you see exactly what was in each salad! 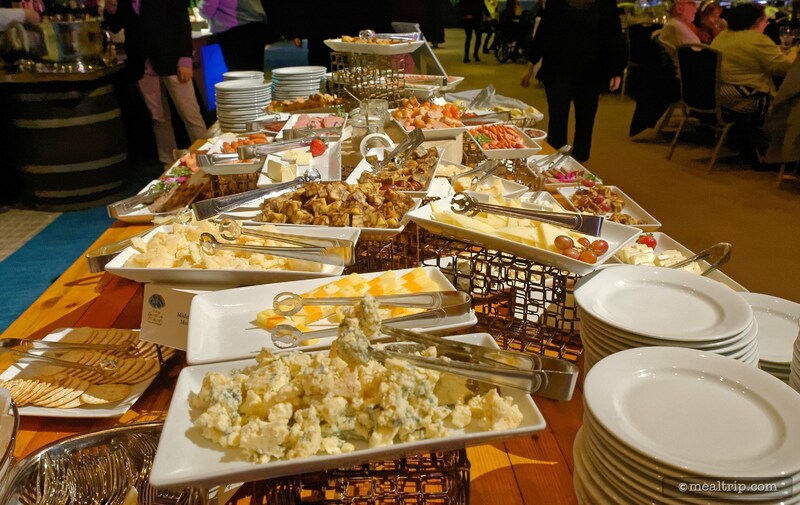 A really large charcuterie, cheese, and bread station was also available. This one featured items that are on the Yachtsman Steakhouse menu. Here's a sideways view of the cheese, charcuterie, and bread table which also included pates, rillettes, and various veggies! 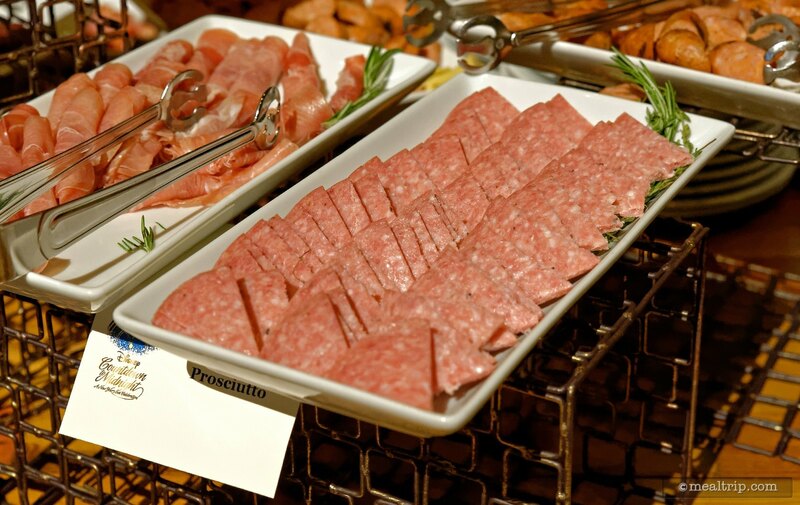 Here's a closer look at some of the meats available at the charcuterie station. 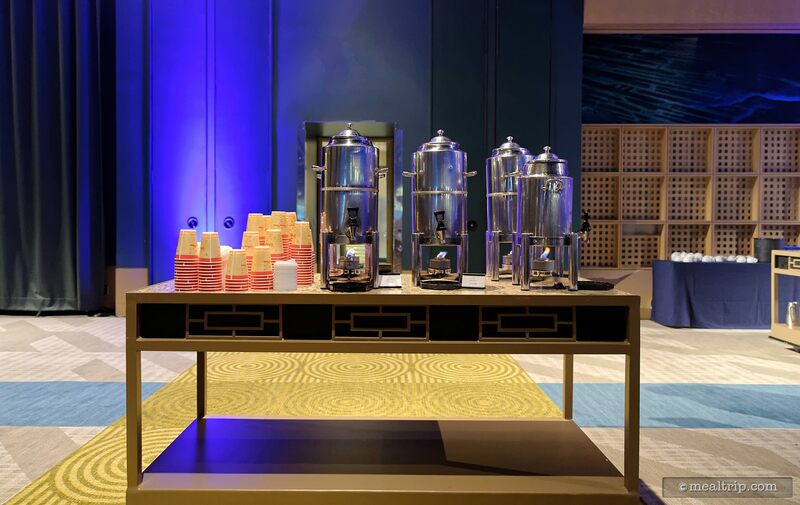 About half-way through the night, these coffee and tea stations started showing up... or maybe I just started to notice them half-way through the night! 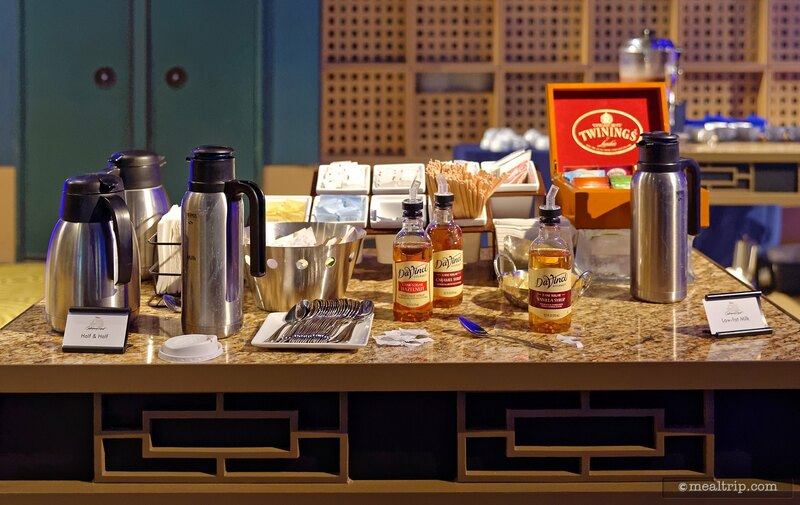 Here's a closer look at one of the coffee and tea stations that were located around the Fantasia Ballroom. Each table of 10 (or more) was numbered but there are no "assigned" seats per-say. You can just pick a spot. Each place setting had this great printed circle, which when flipped over, listed all the menu items and wine pairings that were available! 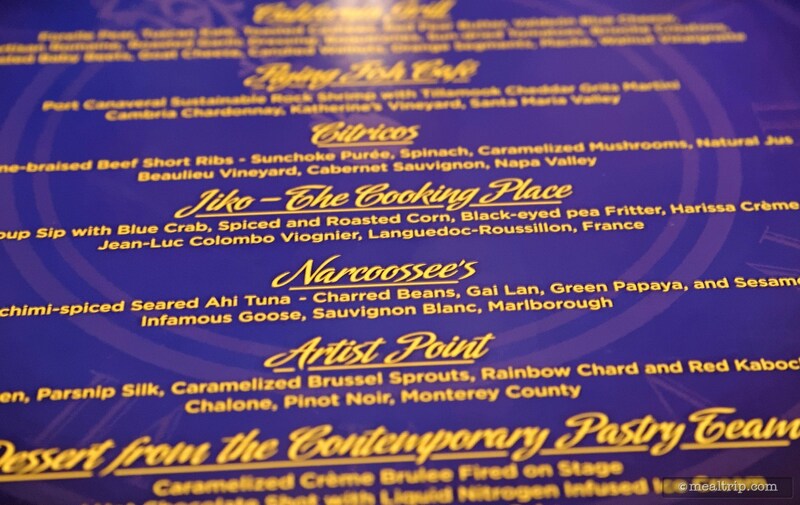 Here's a close up photo of the menu card that was at each place setting. 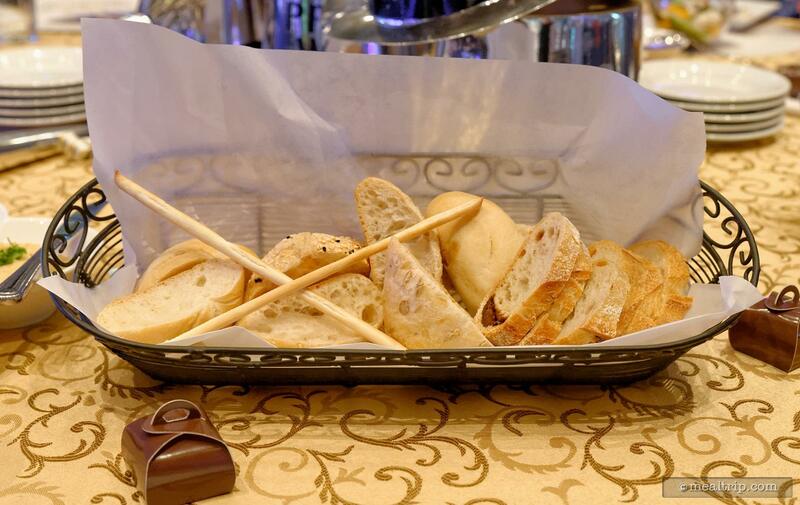 There were two or three bread baskets on each table at the beginning of the event. 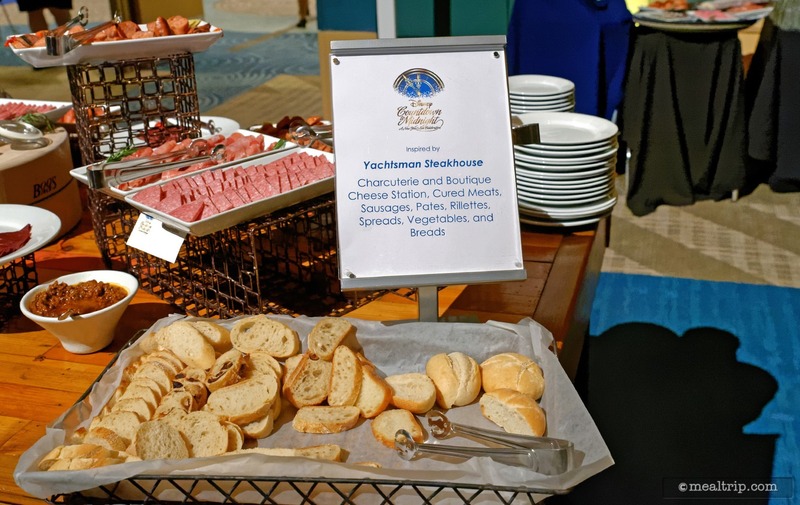 More of the same types of breads (and more) were also available at the Yachtsman Steakhouse Charcuterie and Boutique Cheese Station. 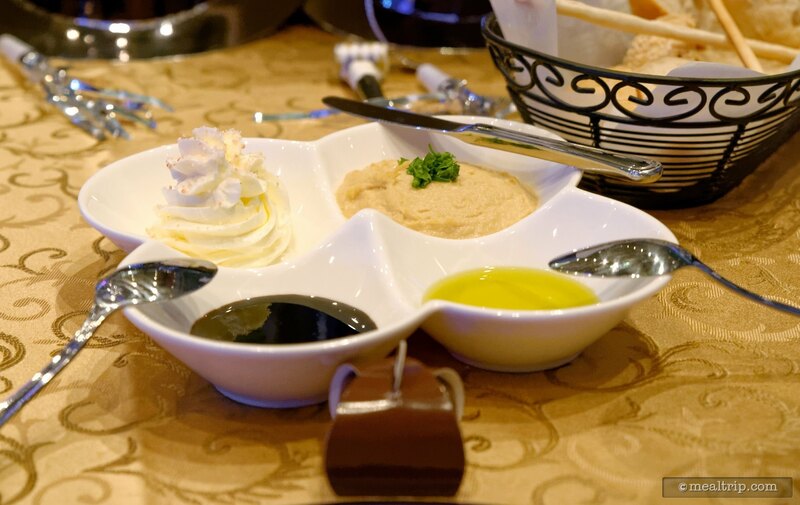 Some dips, spreads, oil, balsamic, and butter were on each table as well. 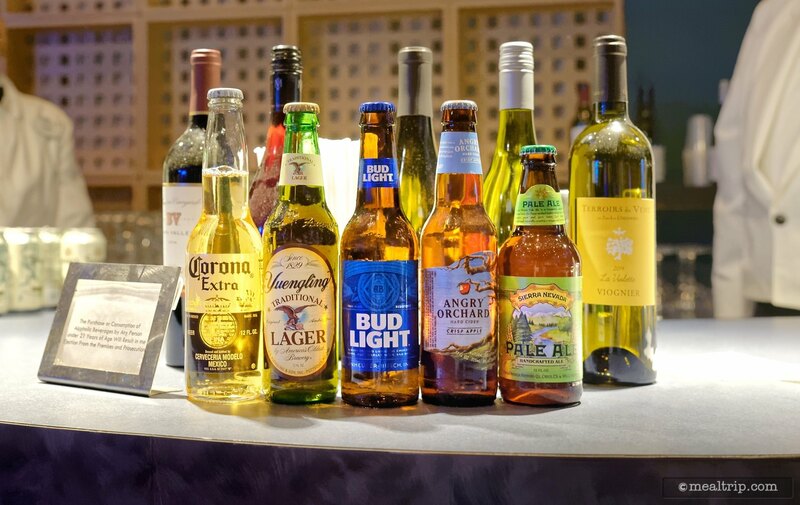 Here again, you could get more of any of these items refilled, or just walk on over to the Charcuterie and Cheese station. 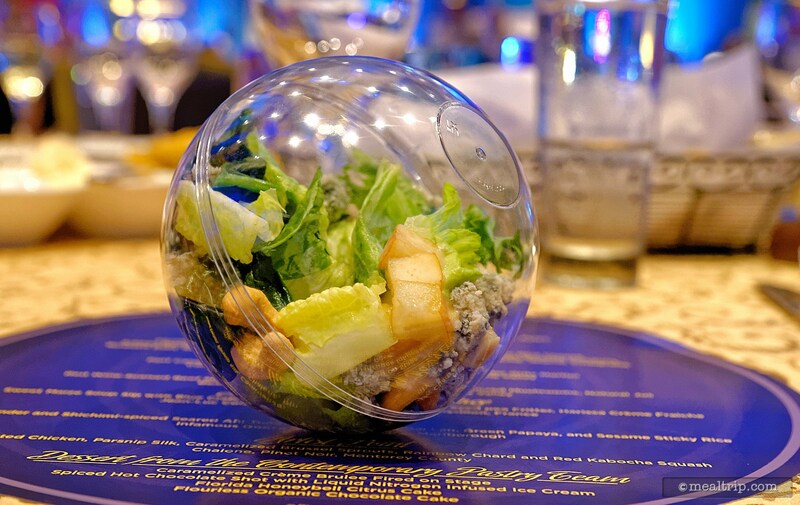 Forello Pear, Tuscan Kale, Toasted Cashews, Red Pear Butter, and Valdeon Blue Cheese Salad from the California Grill Station at Disney's Countdown to Midnight New Year's Eve event. 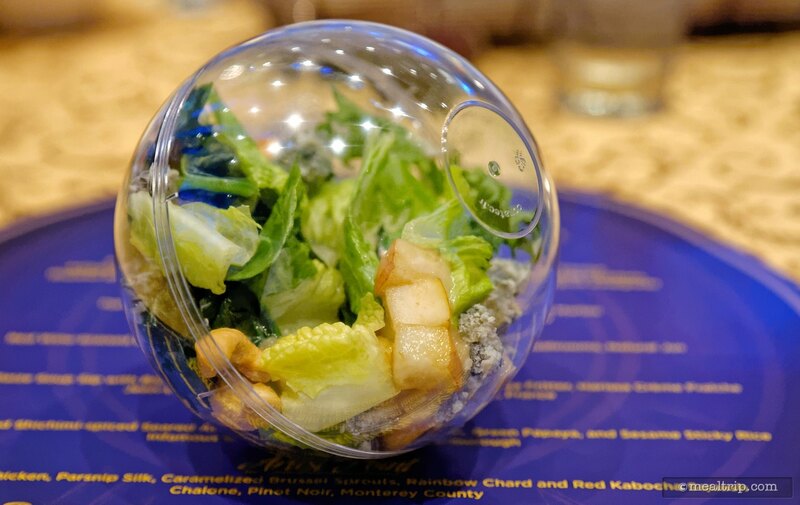 A closer look at the Forello Pear, Tuscan Kale, Toasted Cashews, Red Pear Butter, and Valdeon Blue Cheese Salad from Disney's Countdown to Midnight New Year's Eve event. 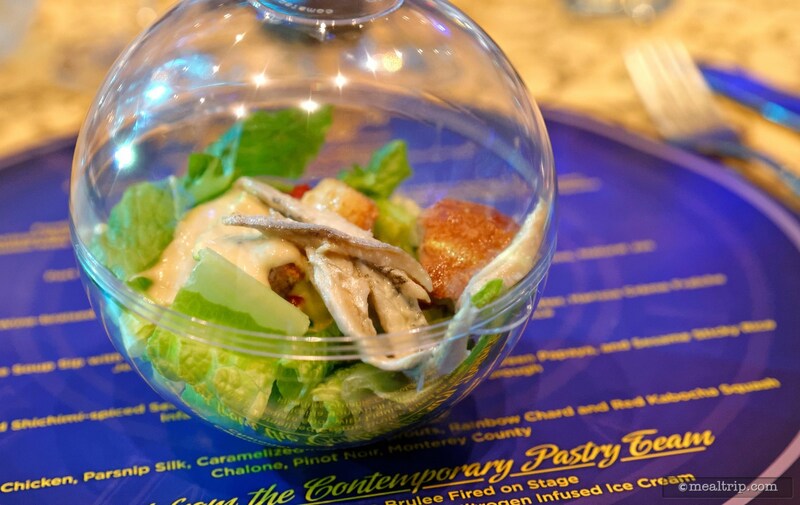 Here's another one of the salads from California Grill - this one features Artisan Romaine, Roasted Garlic Dressing, Boquerones, Sun-dried-Tomatoes, and Brioche Croutons. 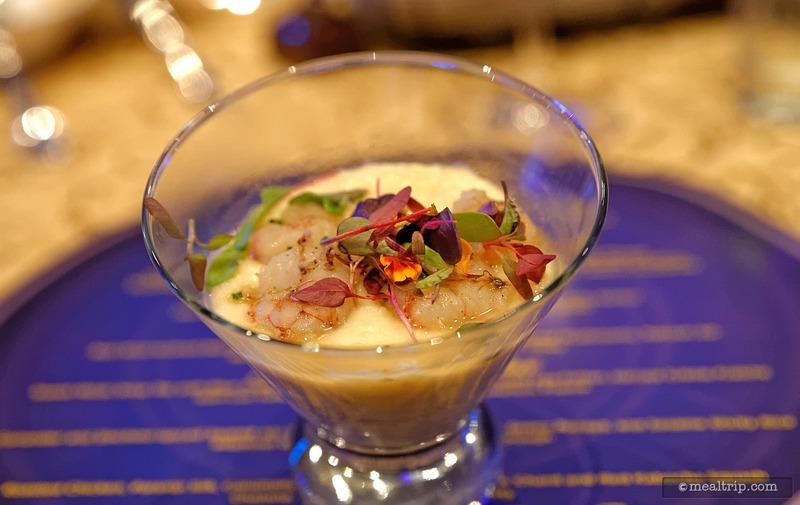 Flying Fish presented this Port Canaveral Sustainable Rock Shrimp with Tillamook Cheddar Grits Martini (it was in a martini glass), which was paired with the Cambria Chardonnay from Katherine's Vineyard. 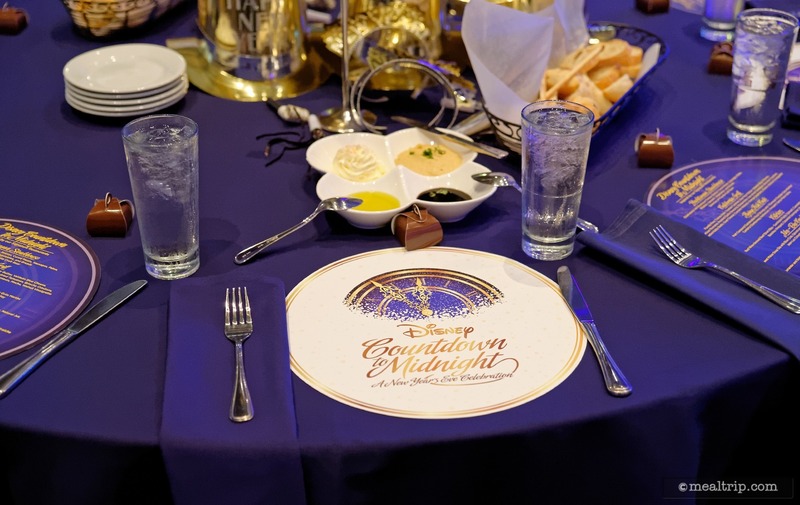 Here's a closer look at Flying Fish's Port Canaveral Sustainable Rock Shrimp with Tillamook Cheddar Grits Martini from Disney's Countdown to Midnight New Year's Eve Event. 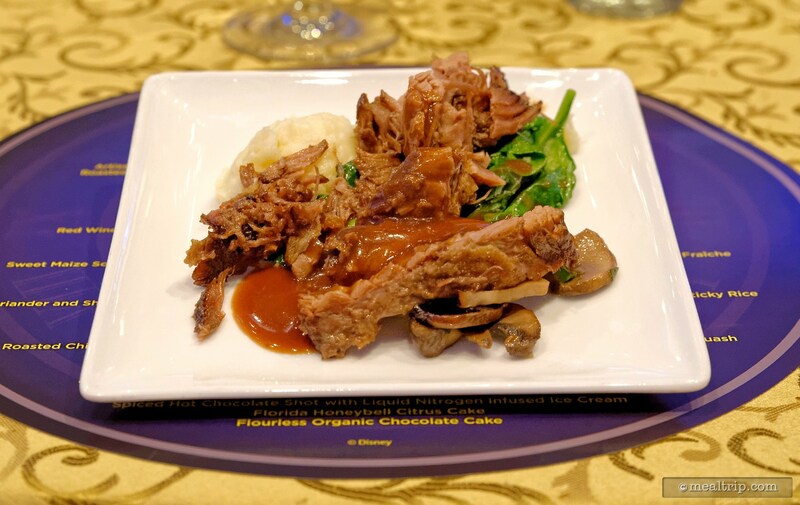 The culinary team from Citricos presented this Red Wine-braised Beef Short Rib with Sunchoke Puree, Spinach, Carmelized Mushrooms in a Natural Jus. 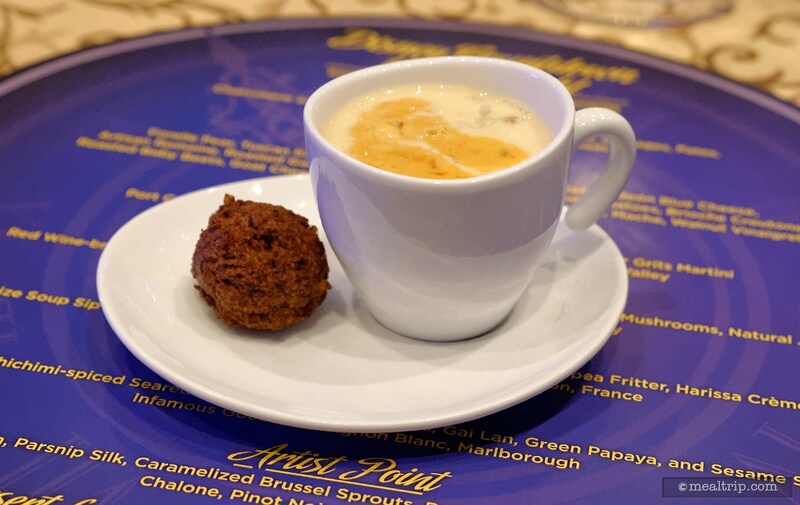 An amazing restaurant at Animal Kingdom brought this Sweet Maize Soup with Blue Crab, Spiced and Roasted Corn, Black-eyed pea Fritter, and Harissa Creme Fraiche. 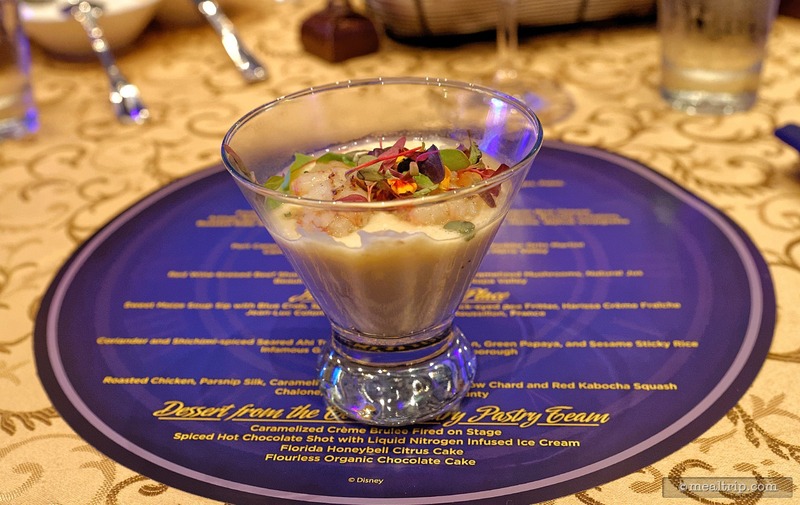 The thick creamy soup was pair with the Jean-Luc Colombo Viognier from France. This was a great dish! 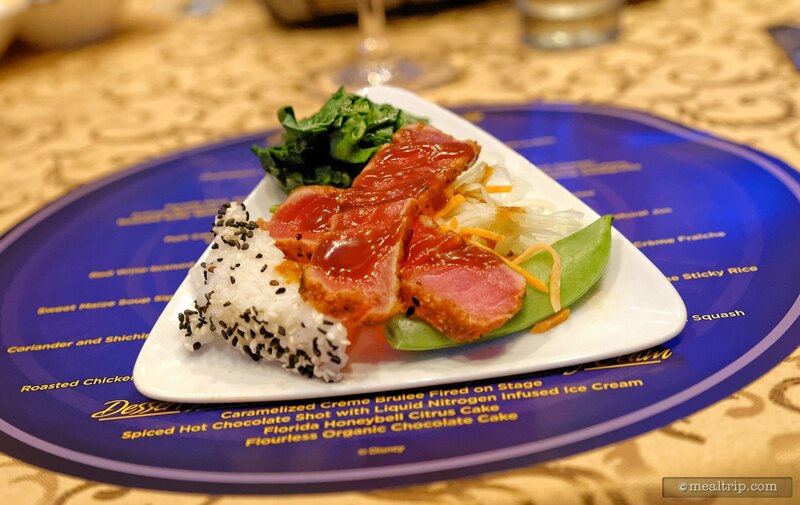 Narcoossee's presented this Coriander and Shichimi-spiced Seared Ahi Tuna with Charred Beans, Gai Lan, Green Papaya, and Sesame Sticky Rice. 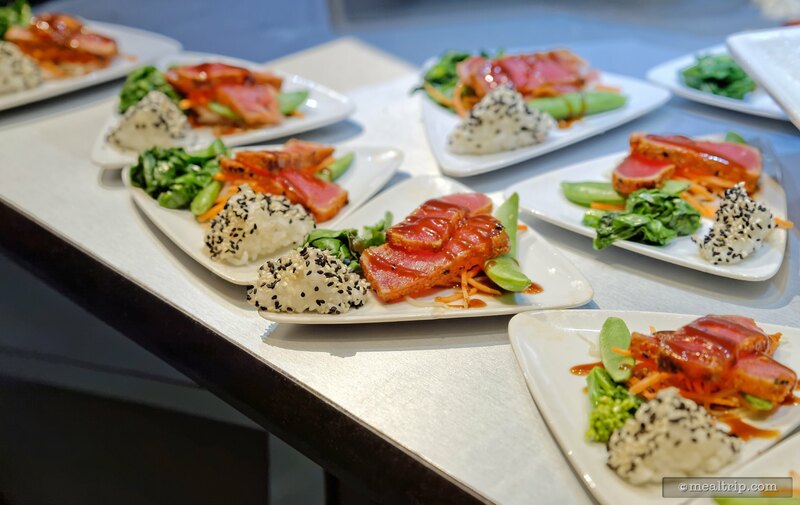 This Coriander and Shichimi-spiced Seared Ahi Tuna with Charred Beans, Gai Lan, Green Papaya, and Sesame Sticky Rice was paired with an Infamous Goose, Sauvignon Blanc, Marlborough. 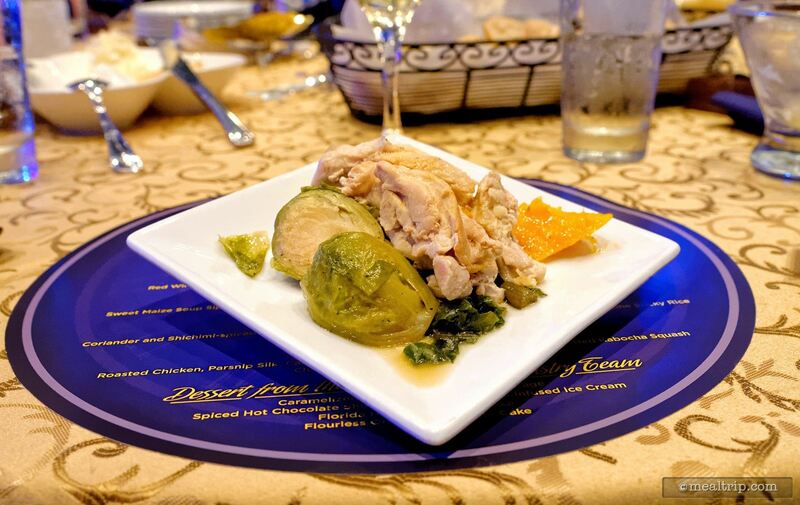 Artist Point created this Roasted Chicken with Parsnip Silk Caramelized Brussel Sprouts, Rainbow Chard and Red Kabocha Squash. 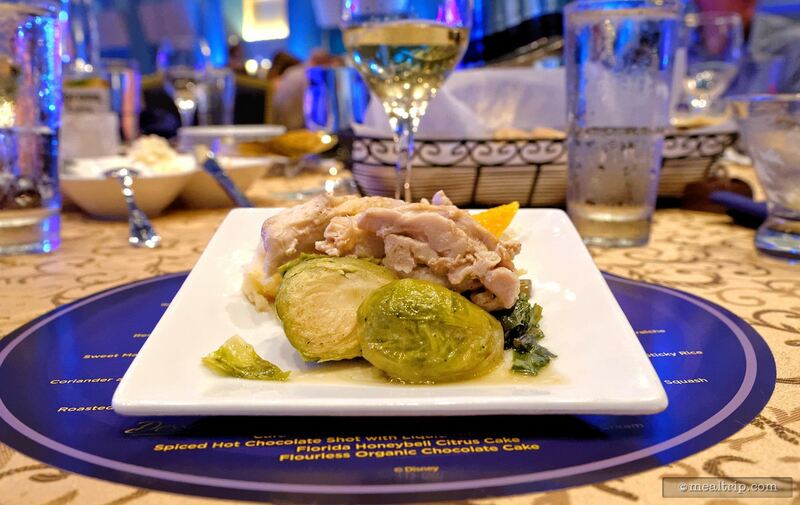 The Roasted Chicken with Parsnip Silk Caramelized Brussel Sprouts, Rainbow Chard and Red Kabocha Squash from Artist Point was paired with the Chalone, Pinot Noir. 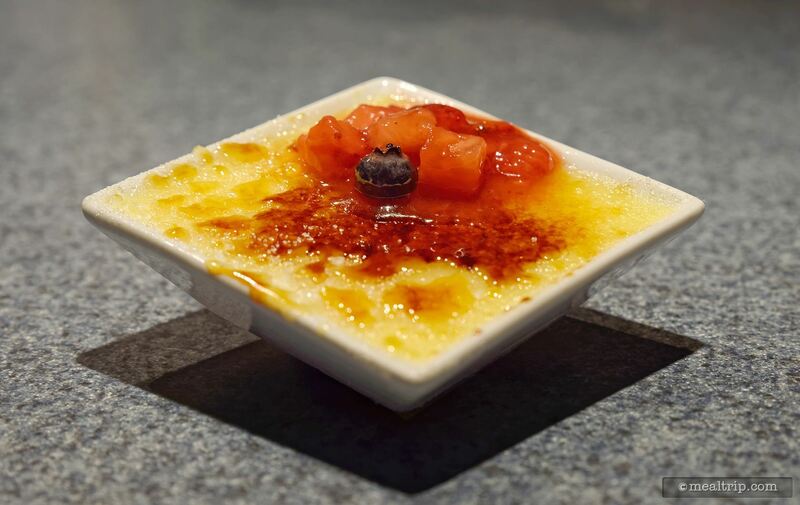 About halfway through the event, dessert stations started showing up (but the food stations were all still available as well)... here's a Caramelized Creme Brulee that was fired fresh on-stage! 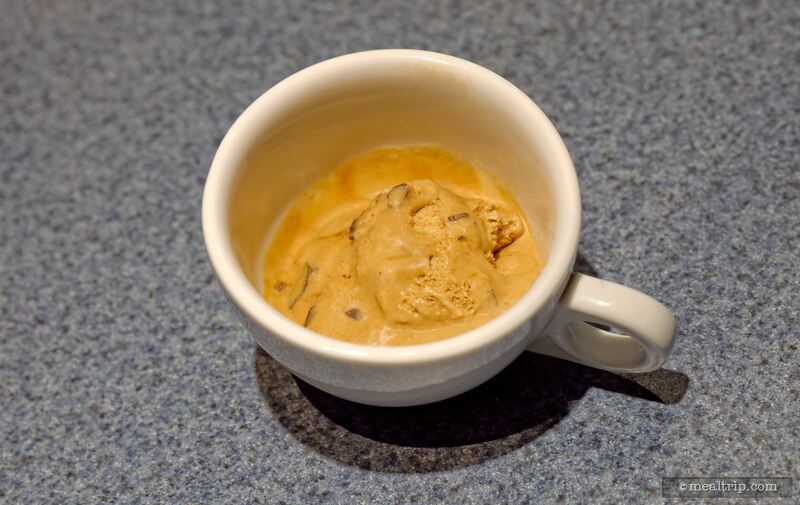 While it may not look like much this Spice Hot Chocolate Shot with Liquid Nitrogen Infused Ice Cream was really decadent. This was so good, I had two or three! 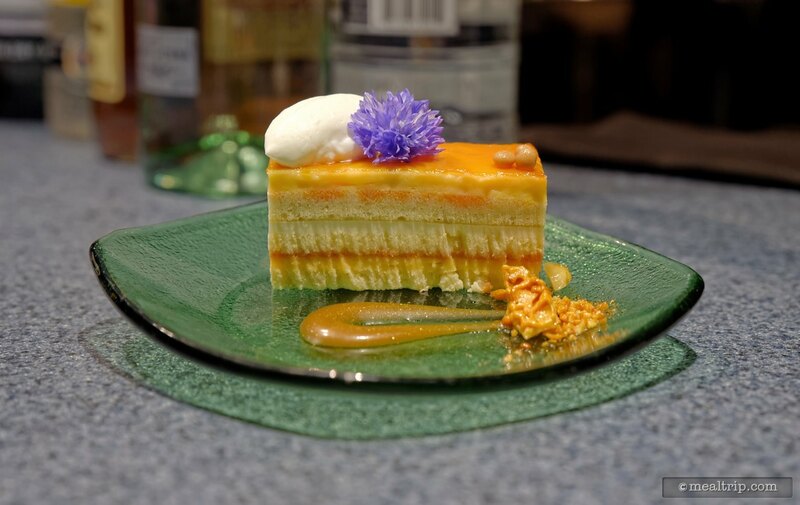 It's a Florida Honeybell Citrus Cake, and it was just so refreshing without being too sweet. 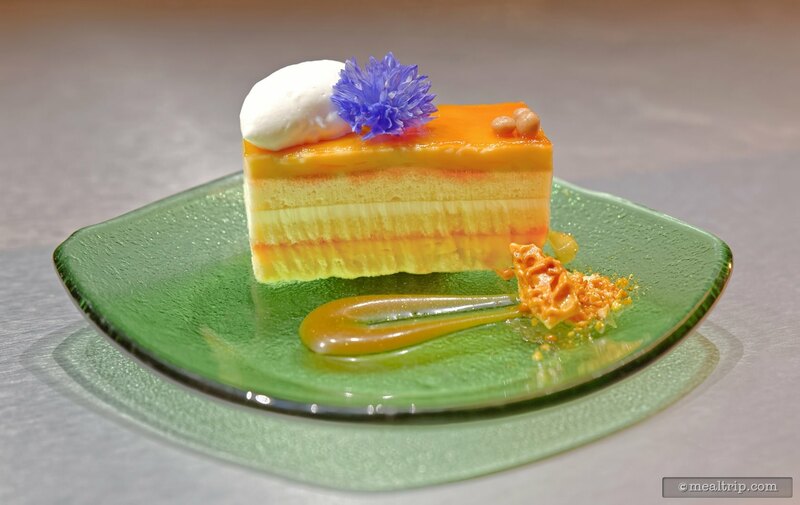 This Florida Honeybell Citrus Cake was created for the event by the Contemporary Pastry team! It's so pretty! 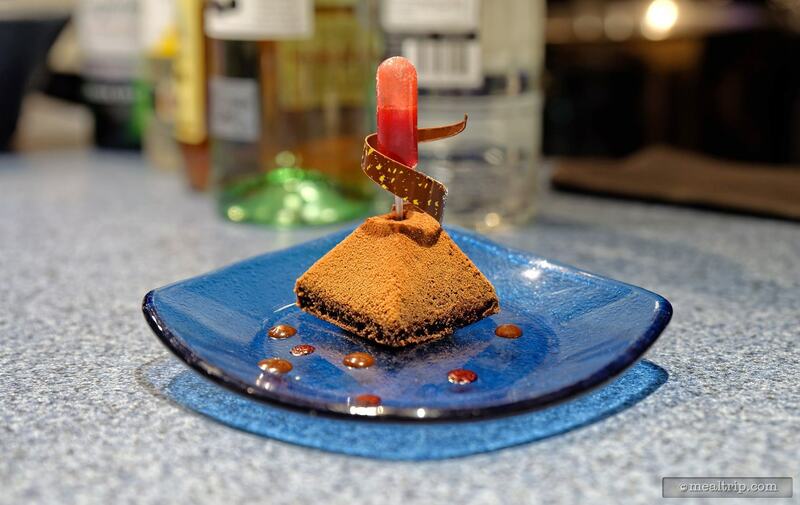 Here's a Flourless Organic Chocolate Cake with a shot of Raspberry Coulis. 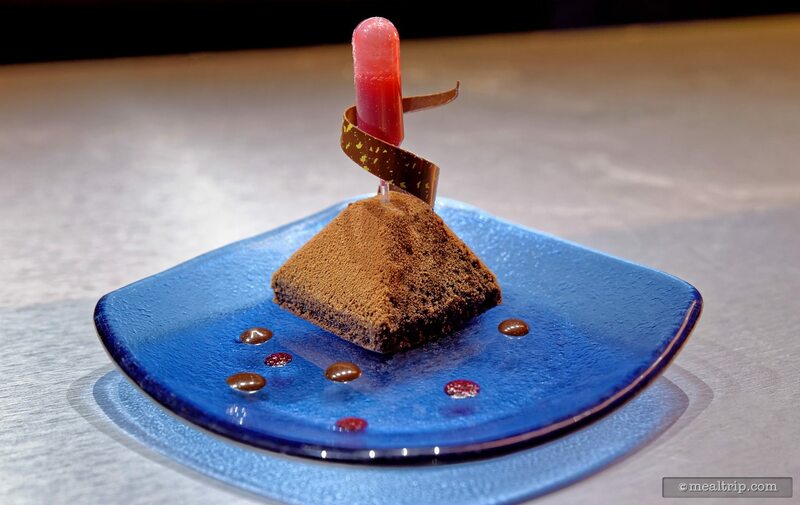 The Pastry Chefs from the Contemporary created this Flourless Organic Chocolate Cake with a shot of Raspberry Coulis which paired very nicely with the sparkling wine that was available after midnight. 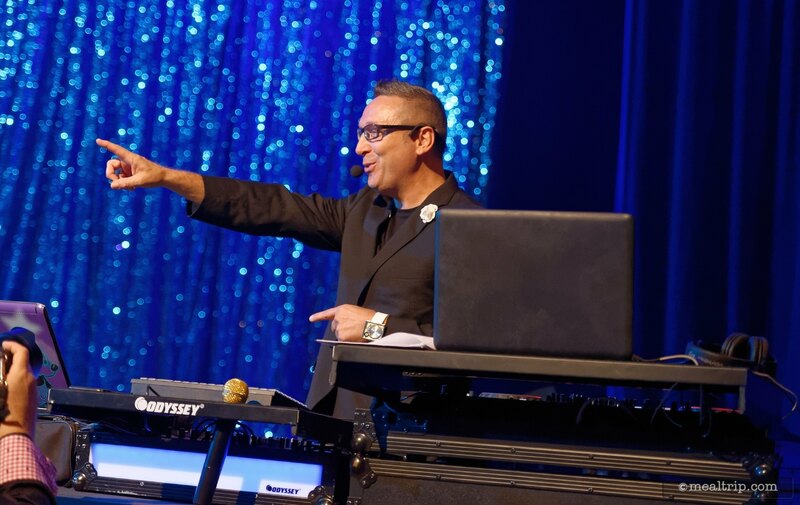 There are also a couple of DJs at Disney's Countdown to Midnight event that spin tunes before and after the live band's high-energy performance. In previous years there have been some really top-notch cover bands at the Countdown to Midnight event. 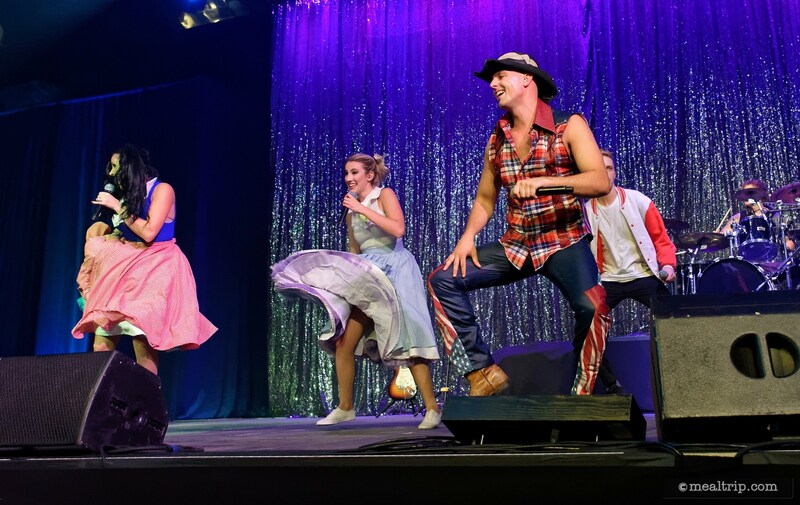 This quick change group always had outfits that matched the period of time the music they were performing was from! 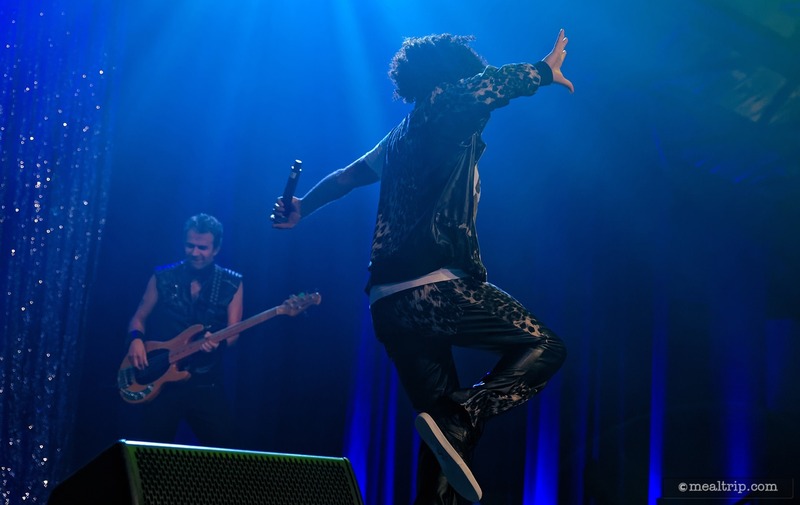 All kinds of styles and genres of music were covered, and it was all high energy dancing excitement! Perfect for a New Year's Eve band! 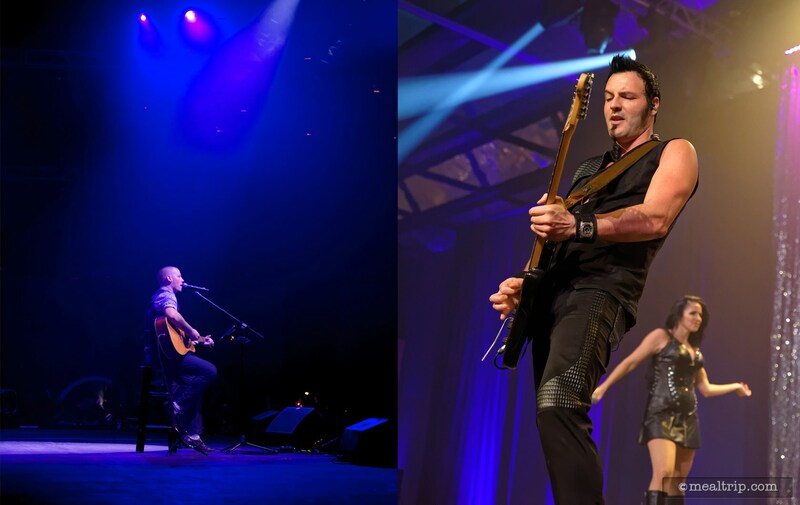 There were additional bands performing in places where the main band was not! This trio was located outside on the Porte Cochère. 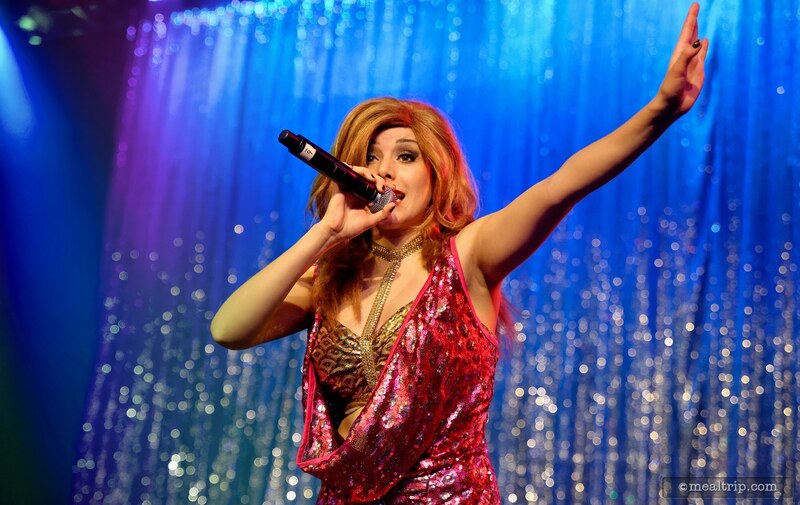 Disco anyone! 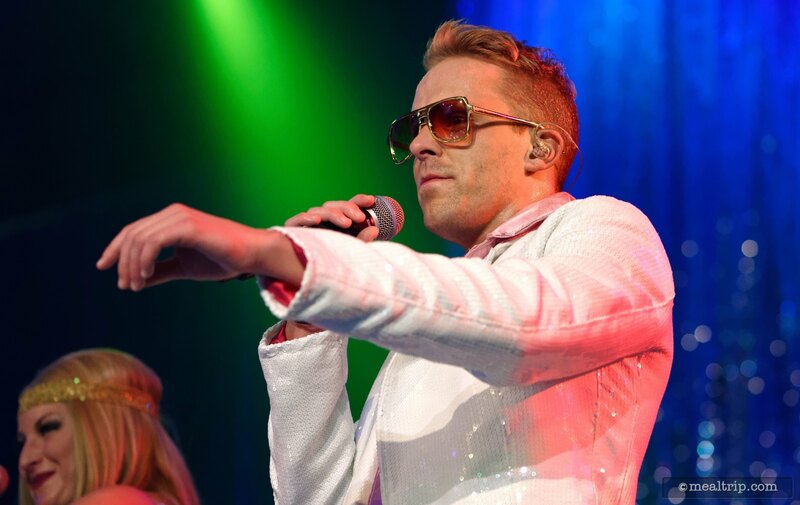 Heck yeah... it's New Years Eve!!!! 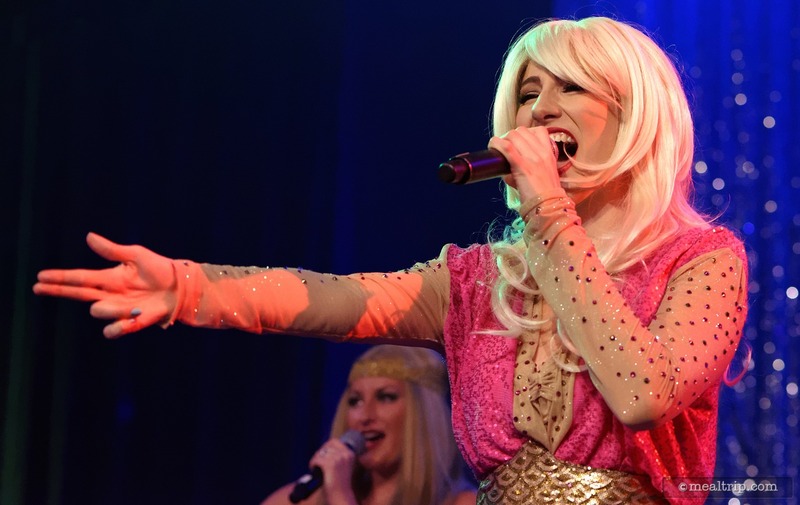 I have no idea what musical era we're in now, but I still like it! 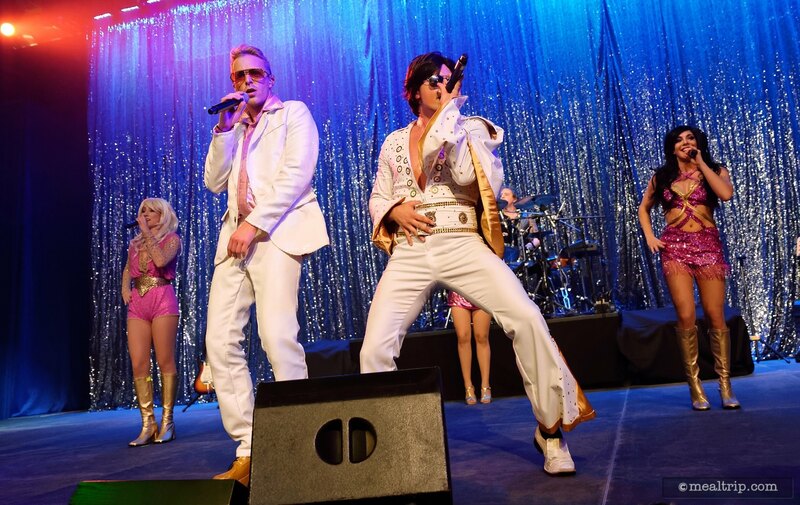 From Motown to Modern-day the high-energy New Year’s Eve Bash Band had everyone on their feet! When the event first started, the music was provided by a single guitarist and was a little "corner bookstore" themed, but as the night progressed, so did the music and energy level! 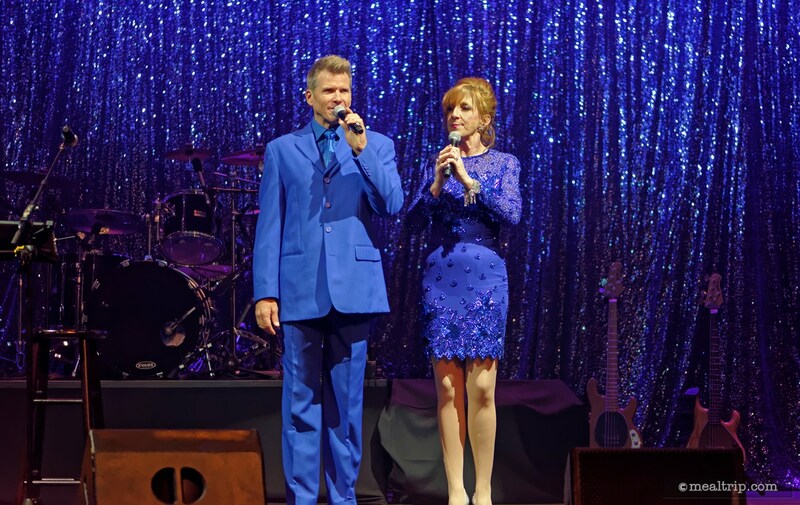 The quick-change costumes were very authentic to the period of music that was being performed! That might be a wig, but those are real tattoos! 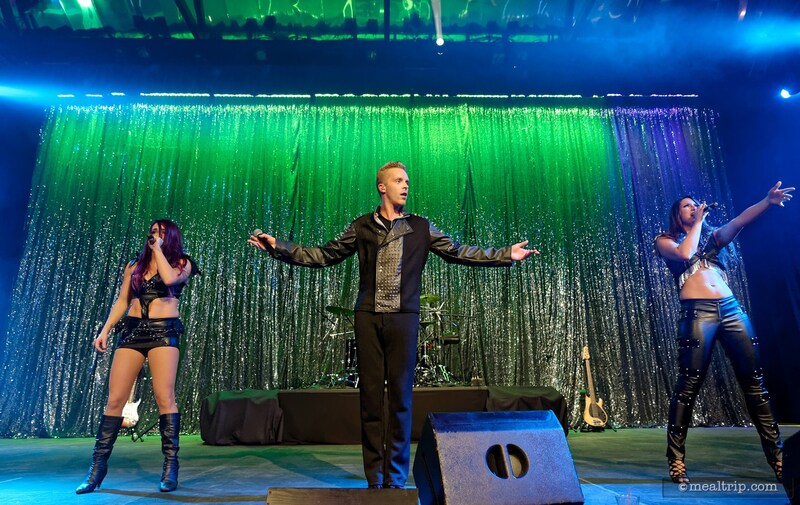 The live band can make or break an event like Countdown to Midnight, and this band was spot-on amazing! 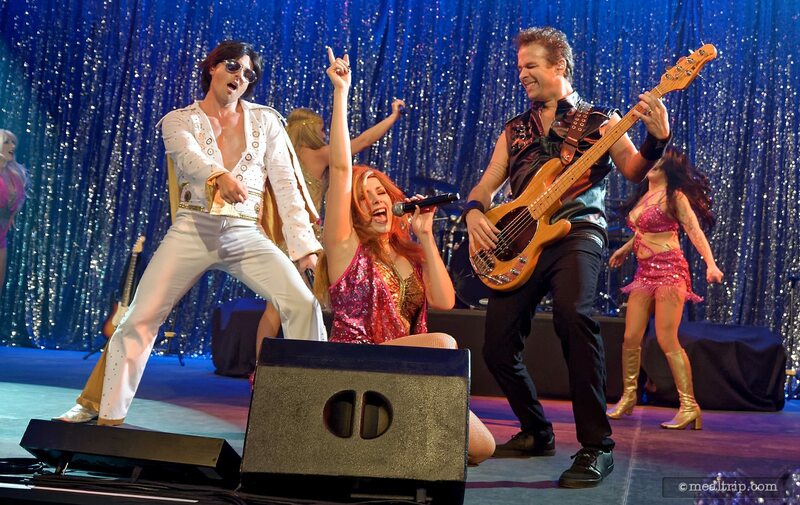 Music Mixup - Elvis, Disco, and Hard Rock, all at once!!! 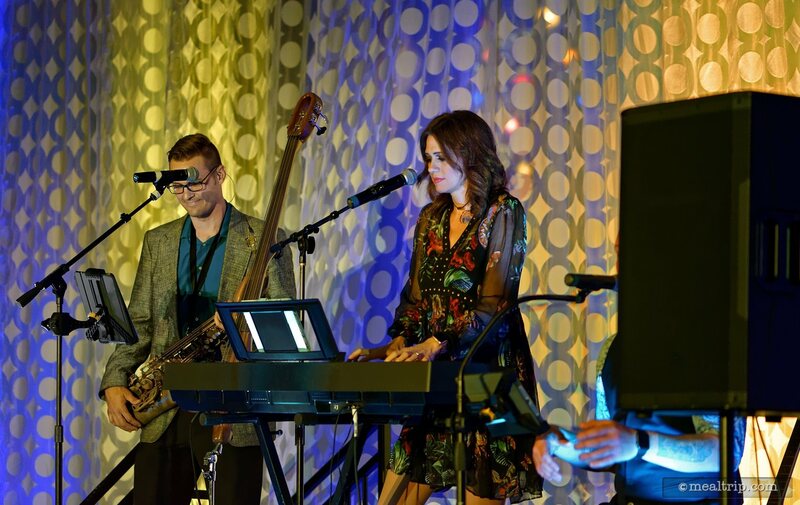 Such a great band at the Countdown to Midnight event at Disney's Contemporary Resort. 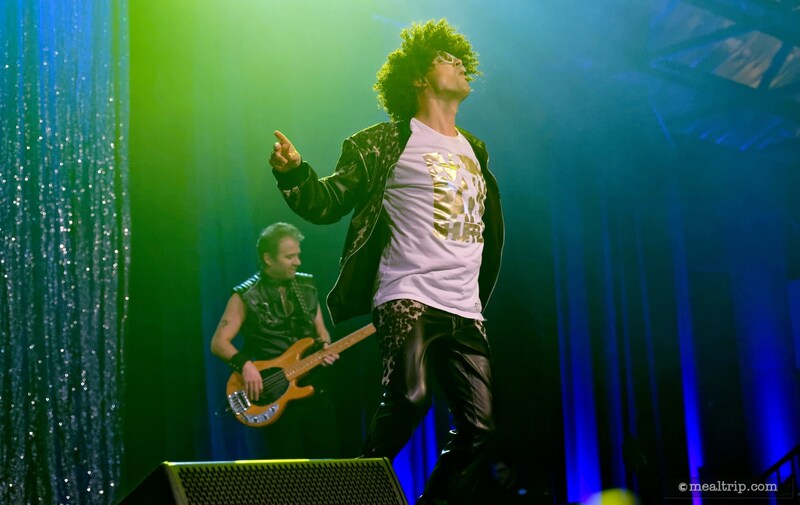 The best of 80s pop! 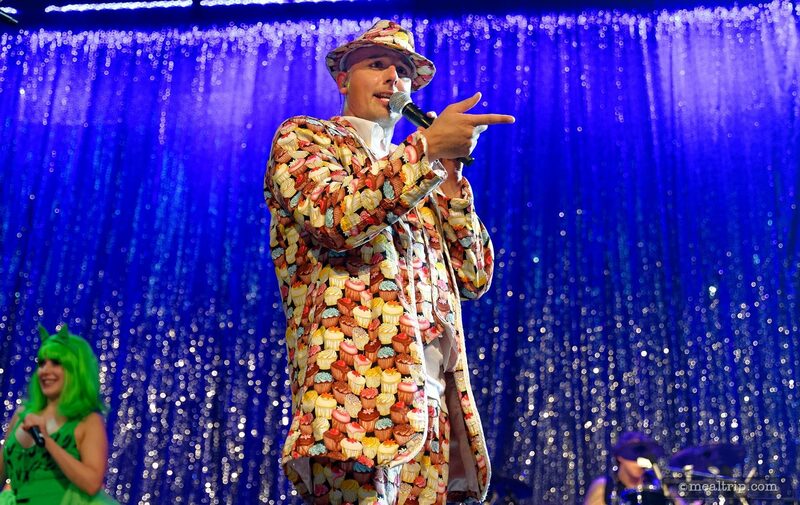 Have you ever seen a cupcake suit? How cool is that? Hello Kitty and that cool Cupcake Suit!!! There's some edgier hard rock in here too! You can tell, because everyone has switched to black leather. You know the songs are getting edgier when the band is in black leather. 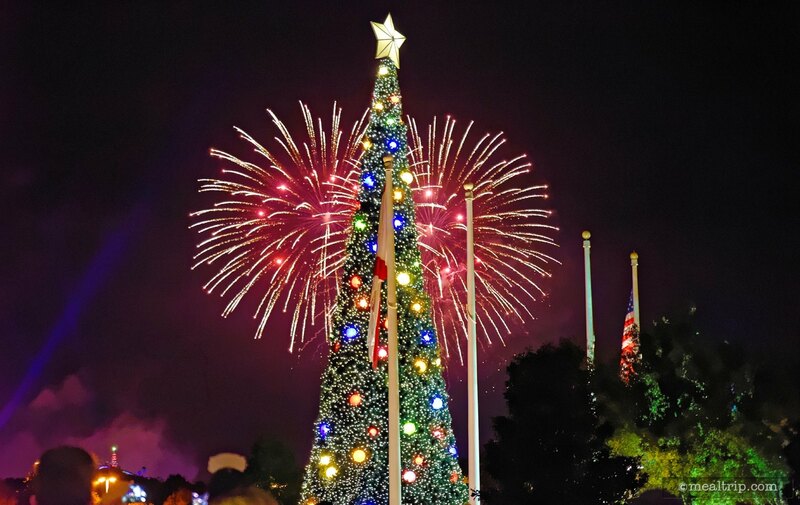 A little hard rock at Disney's Countdown to Midnight New Years Eve Event. 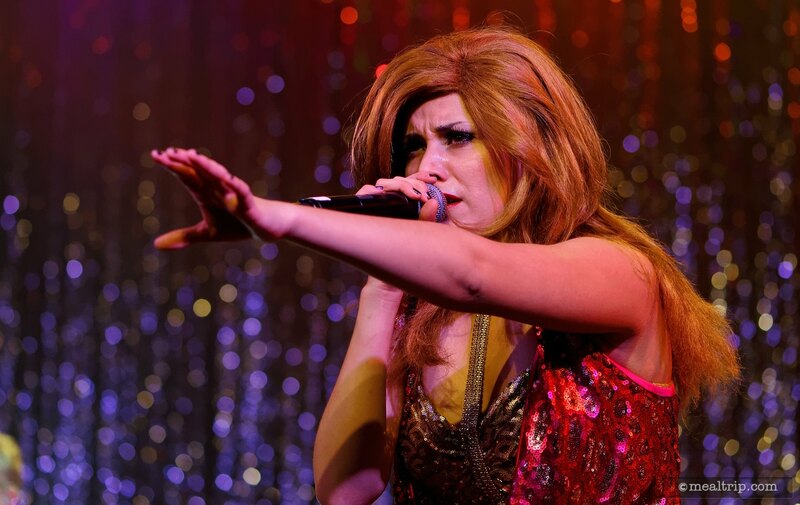 Now we've moved into a little hard rock and the whole group quick changes into black leather! 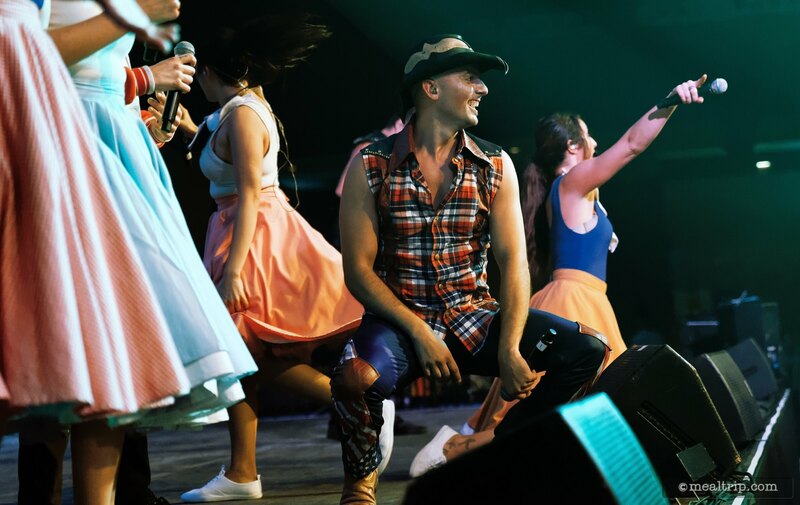 The amazing band covers everything from the 50s to today!!! Almost midnight!!! 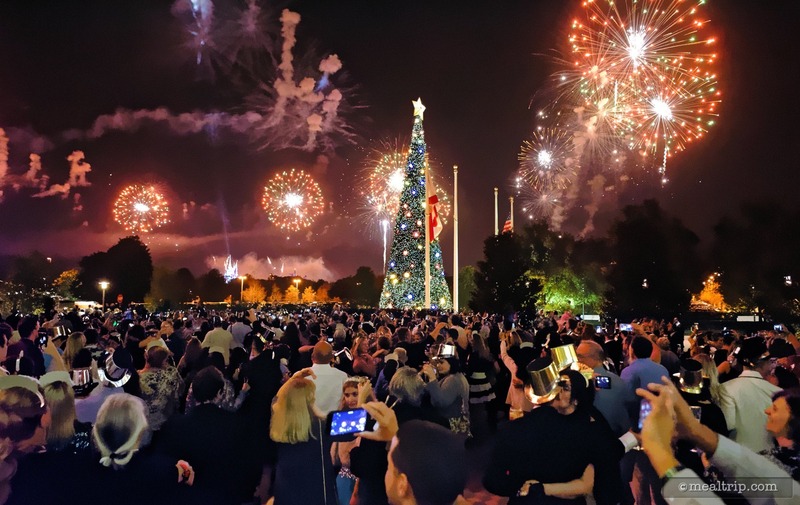 Everyone (who is 21 or older) is invited to grab a glass of bubbly and head outdoors to watch the fireworks! 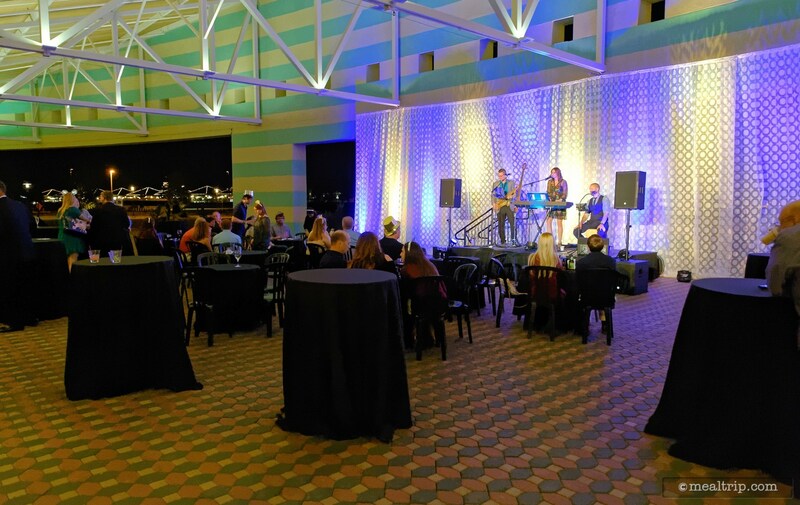 The covered Porte Cochère is very large and offers an ok view of the fireworks, but just step outside a few feet and you'll get the best view! 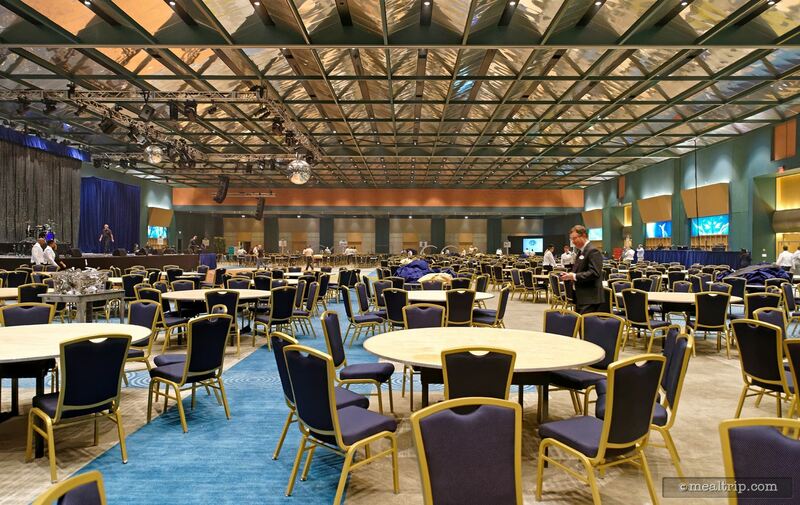 The covered and uncovered areas are large enough to accommodate everyone. There's enough space around so you don't really feel packed in. You can totally see all the perimeter fireworks around the castle. It's a pretty great view actually. 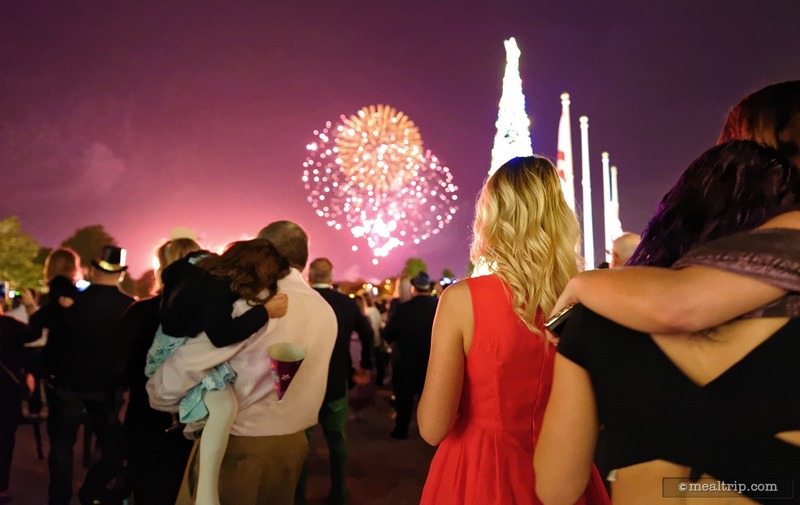 It really is a special, unique view of the fireworks over the Magic Kingdom. Hidden New Year's Eve Mickey! Maybe? Sort of? In all fairness, I tested many, many libations over the course of the evening. Once back inside, there's was another mock "Happy New Year" moment for those guests who were watching the fireworks! 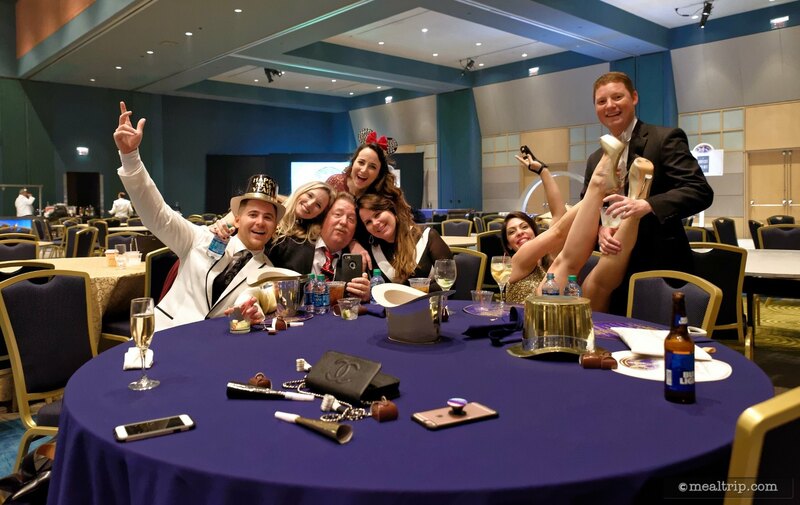 Another element that can make or break an event is the staff - and these cast members were beyond awesome! 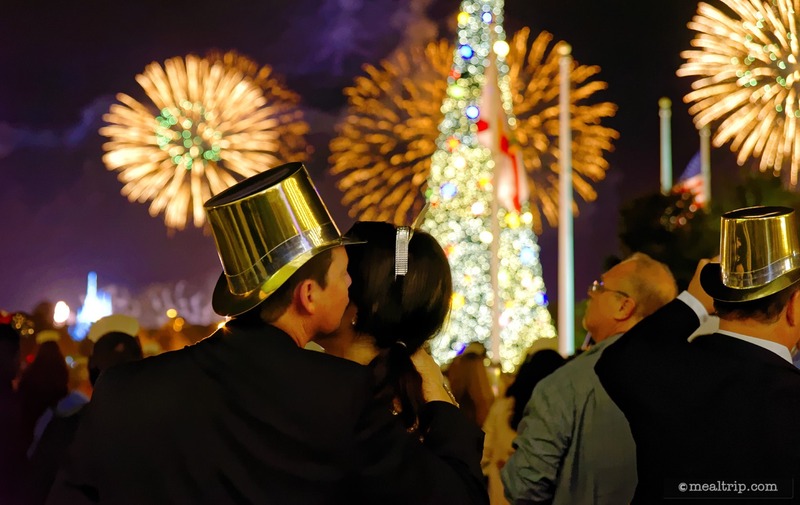 Happy all night, to be taking care of you, on your special New Year's Eve celebration. How cool is that? Pretty cool. I have no idea who this family is... but they're having so much fun!!! This really is one of those fun, amazing, special "wow" events - and I hope it stays that way for years to come!